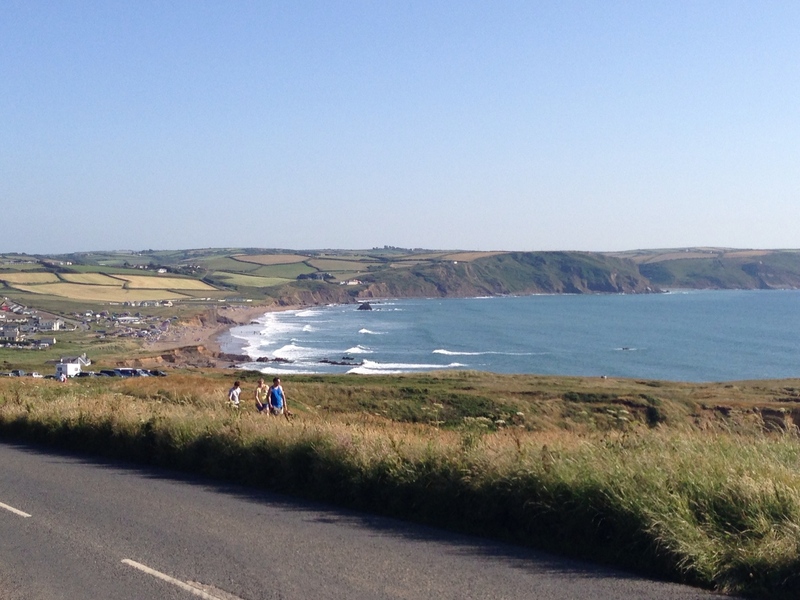 What an ace day, covering 85 miles through Cornwall and Devon, over 4 ferries, in gorgeous weather. And my legs seems to have acclimatised to the West Country hills too. My tent was pretty hot when I woke up, indicating another great day was on the cards weather wise. I rolled out into the fresh air, quick to get out of the oven like conditions the Akto can create in direct sunlight. One drawback of sleeping in a tent is you can’t really have a lie in when it gets hot, unless you want to emerge slightly hard boiled. Mind you when the weather gets good you don’t need a tent, unless there’s an abundance of midges or mosquitoes as there had been in Scotland. 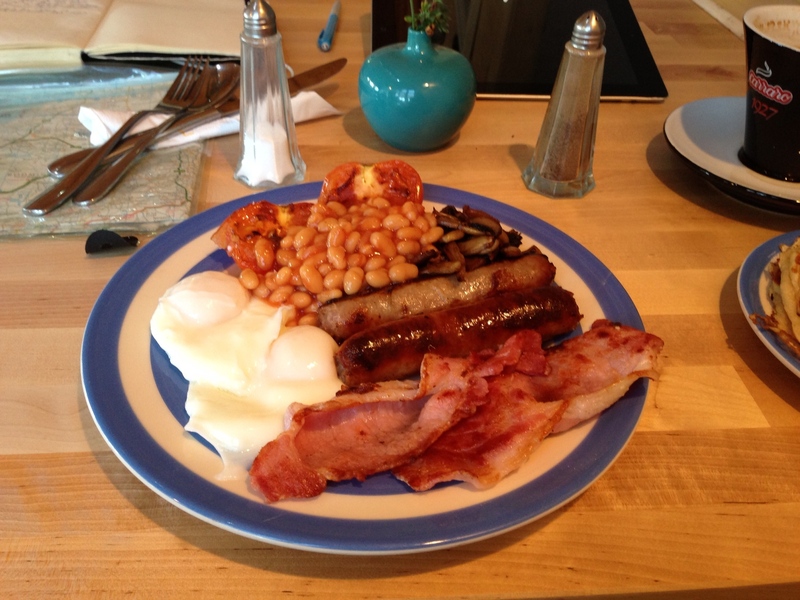 After a shower and a quick breakfast – I was still full from last nights feasting – I packed up and was on the road by 09.30. My objective for the day was to use 4 ferries to cross rivers along the coast, and get back into Devon. 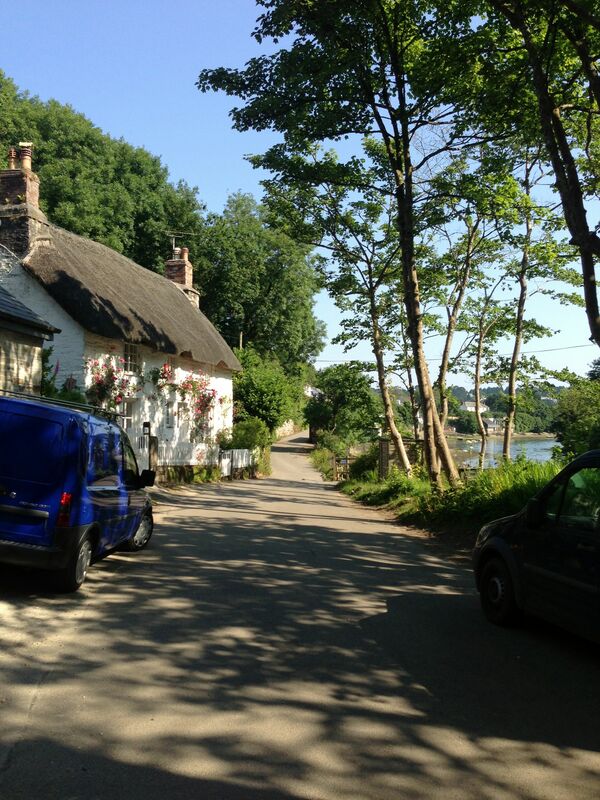 My first stop was Helford Village, a picturesque spot on the banks of the Helford River. 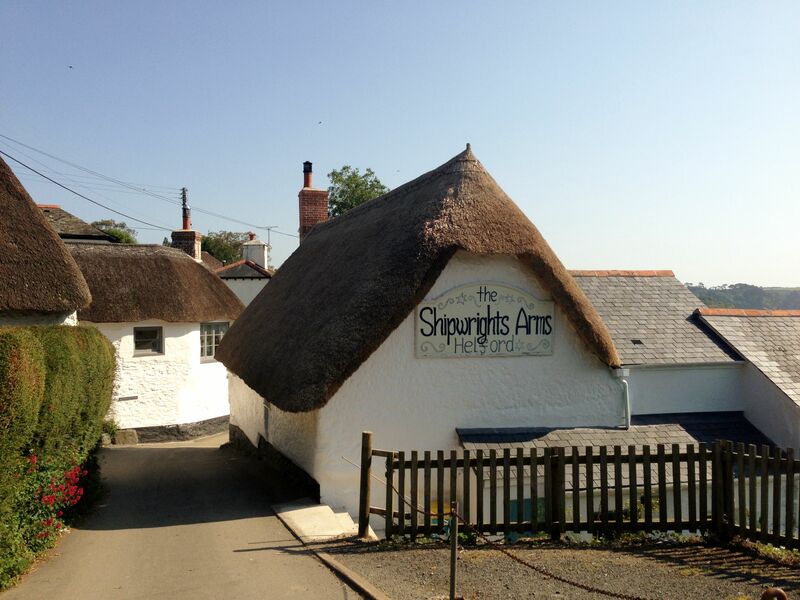 It’s a lovely small village with a great pub, the Shipwrights Arms, but it was a little early to be frequenting a drinking establishment. There’s a bit of a ford you can ride through, but there wasn’t a lot of water in it. I followed a narrow path down to the ferry landing, and had to use the orange disk to summon the boat from the other side of the river. You just open up the disk, which can be clearly seen from the other side, when you want to cross. Better than a phone with little reception in the area, and more fun. After unloading my bike to get it down the steps to the jetty, I sat on the wall to wait for the boat, idly swinging my legs to work some of the latent stiffness out of my muscles. It was a perfect morning and a perfect spot. The ferry duly arrived, and as the lone passenger I loaded my panniers and bike on board with help from the ferry boat skipper Stephanie (think that was her name anyway, apologies if not). Stephanie comes down from Cambridge each year to work the ferry for a few months, which sounds like sounds a pretty idyllic way to spend your summer. I only just had enough money to pay for the crossing, which costs £6 with a bike, however it was worth it for the scenery and experience and saved me a long trek inland to find a bridge. It’s only a short crossing over to Helford Passage, the village on the other side, where I disembarked and a group with an enormous dog got on for a trip back. The dog really wasn’t sure about the whole thing but was eventually coaxed into the boat. 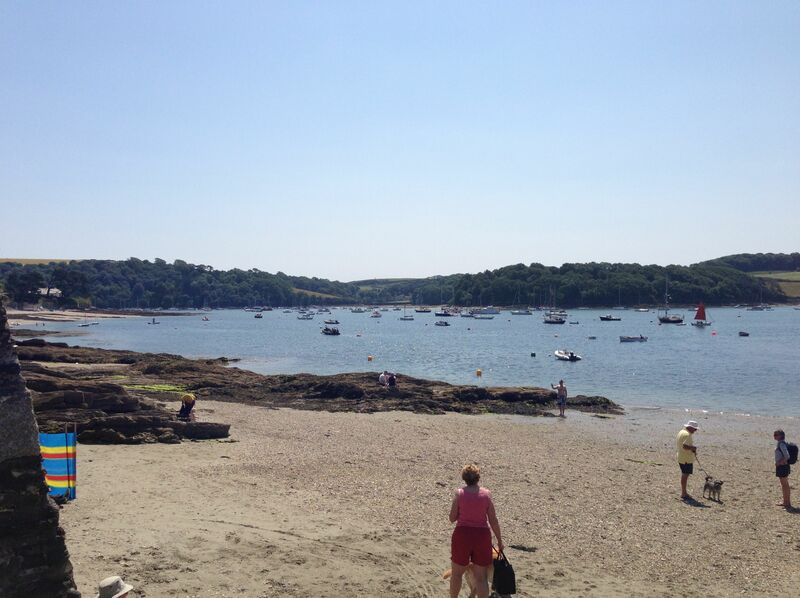 I added Helford to my list of places to come back to , as I pedalled off up a big climb out of the village and took the road around to Falmouth and my next ferry crossing of the day. The Cornish countryside looked and smelt lovely in the sunshine, as I passed through Mawnan Smith and Penjerrick, very Cornish sounding place-names. Falmouth is a much bigger town and I stopped to get some cash out, as well as pick up some supplies. I bought six ripe bananas for 48p from a greengrocers, a bargain, as well as some more sun-cream and multi-vitamins. 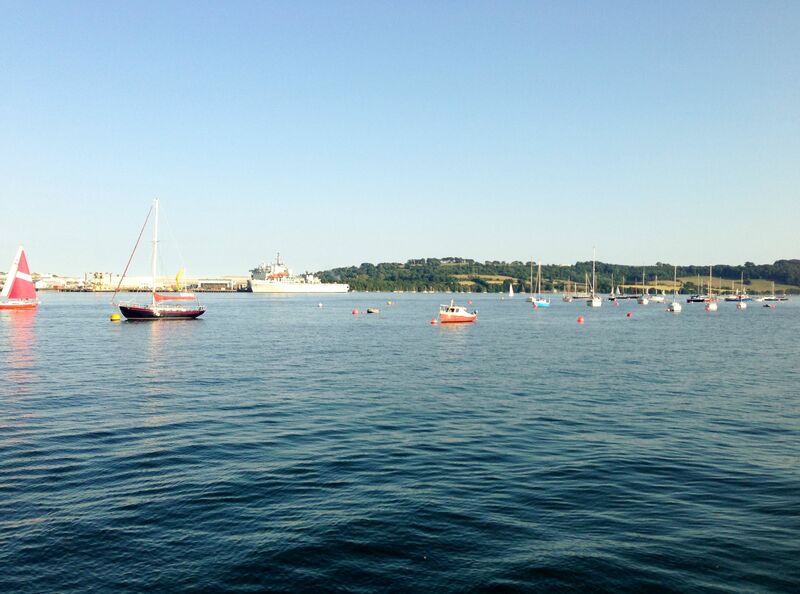 After a cold drink I headed down to the harbour to find a ferry over to St. Mawes. After a bit of a circuit of the town I located a promising ferry, and had to carry my bike and panniers down some steps to get to the boat on Princess Pier. 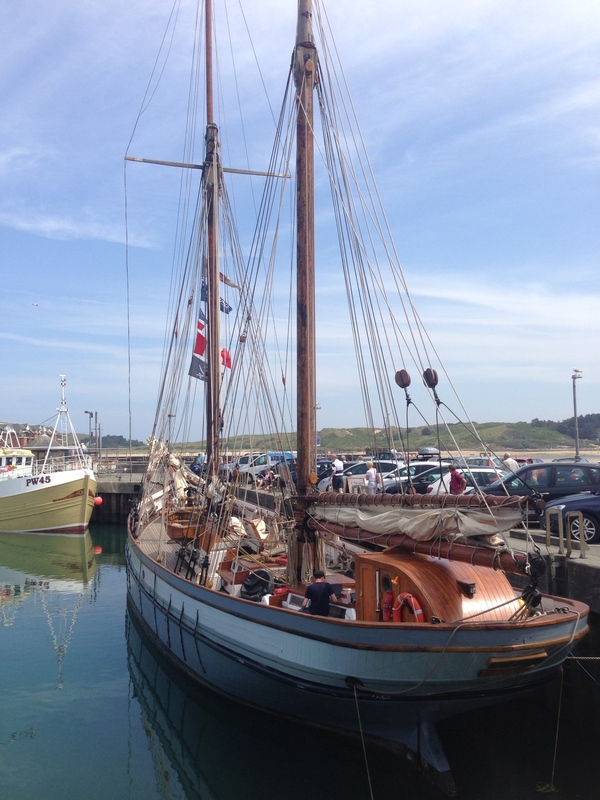 I only just made the 12.15 sailing, and thankfully the crew were on hand to help load everything into the boat, a slightly bigger affair than the Helford ferry. It was a nice crossing over to St. Mawes, during which I chatted to one of the crew for whom today was his first day on the job. It’s a long day and hard work but nice being out in the sunshine and fresh air, providing the weather stays good. 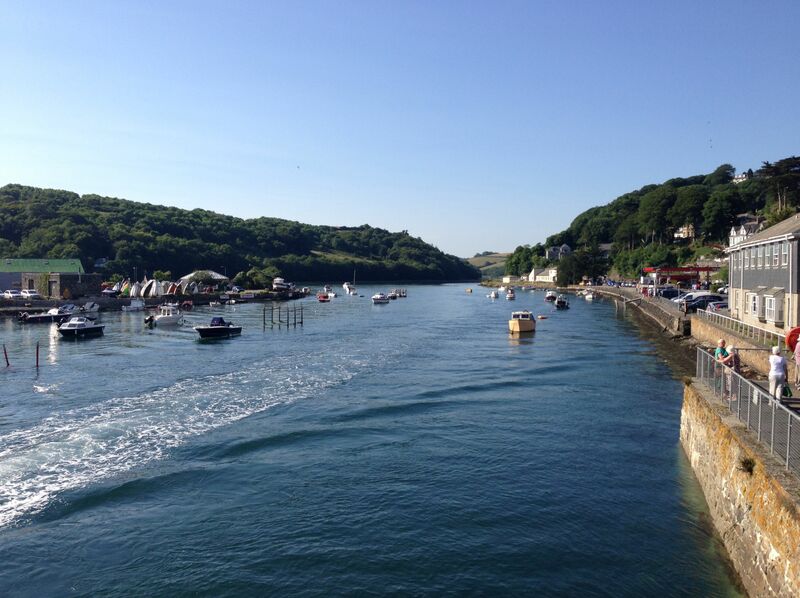 It was good to relate a few of my experiences and learn a bit about the route ahead over to Fowey. There was a guitarist on board who entertained us with a few melodies on the way across, made me miss my guitar but it really wouldn’t have been practical to bring it on tour. I stopped for a bite to eat in St. Mawes, fish and chips; sustainably sourced Icelandic Cod from the Watch House. I don’t usually eat Cod however as the restaurant had gone to great lengths to promote the fact it was from sustainable resources I thought it a safe option. I was glad I’d decided to opt for the traditional seaside delicacy, as it rivalled that I’d had a couple of months back in Whitby, which felt like a long time ago now. With my energy levels restored I pressed on, deciding against using the ferry across to St. Anthony, it was getting expensive on the wallet, and instead taking the A3078 up the hill to St. Just in Roseland. There are a lot of towns and villages around here named after saints. There followed a long stint along country roads towards St. Austell. 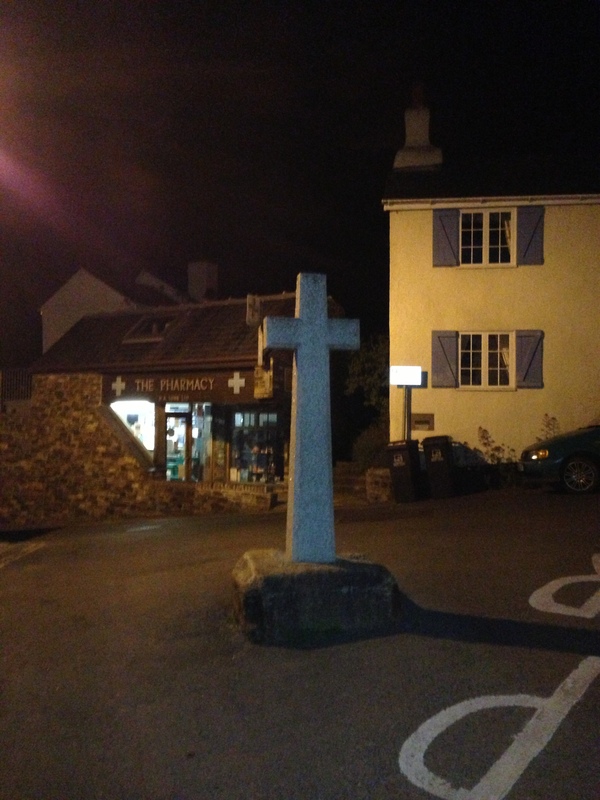 The lanes are a little maze like around this neck of the woods and I took a wrong turning up to Grampound. I also had a few close encounters with the drivers of large 4×4’s and vans, including one interesting altercation between a farm tractor and a shiny Chelsea tractor. As with other day I slipped through leaving them to sort out who was going to back down. Things would be a lot easier if people would just buy smaller cars, half of them only had one or two people in. 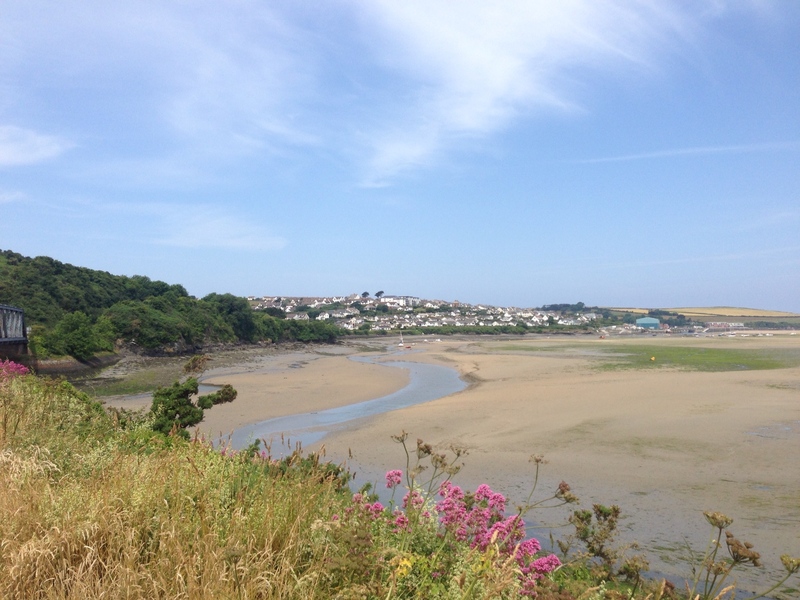 Back on track I headed past St. Austell and down to Fowey, drinking copious amounts of water due to the heat. I paused in Fowey for what I reckoned was a well earned cold pint after tackling a lot of hills, then had a quick look around. 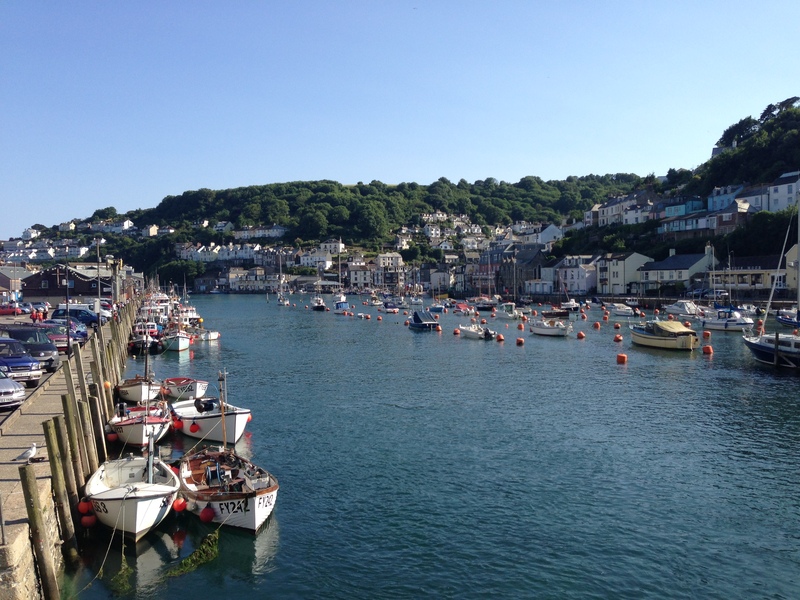 Fowey is another lovely small coastal town, with a ferry that runs across the River Fowey to Polruan. 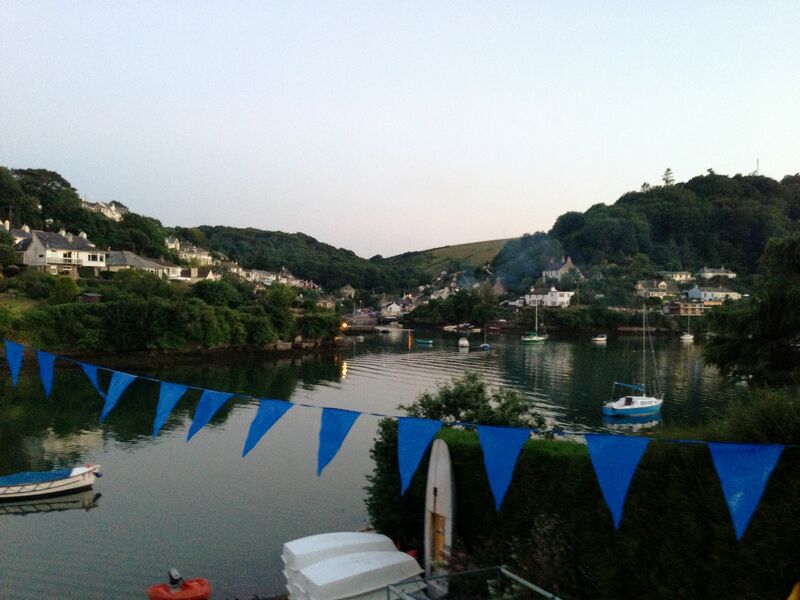 Suitably rehydrated I took ferry number 3 over to Polruan, after negotiating steep steps down to the stone jetty. I was developing a pretty slick process of loading and unloading the panniers from my bike as I carried it and my kit to and from ferries, often up and down steep steps to jetties or piers. 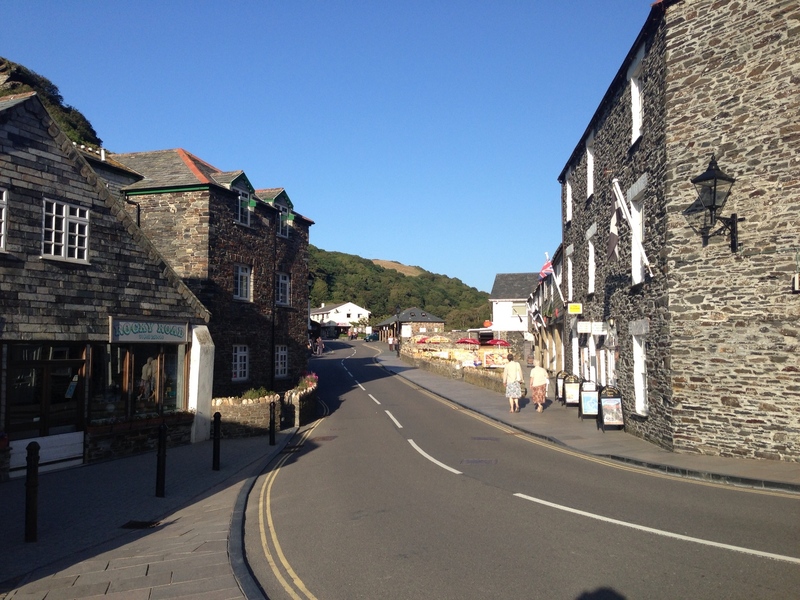 The road out of Polruan involved a leg burning hill climb. I made it up but attracted curious looks from quite a few villagers and tourists, who obviously thought I was slightly mad for not just pushing my bike up. 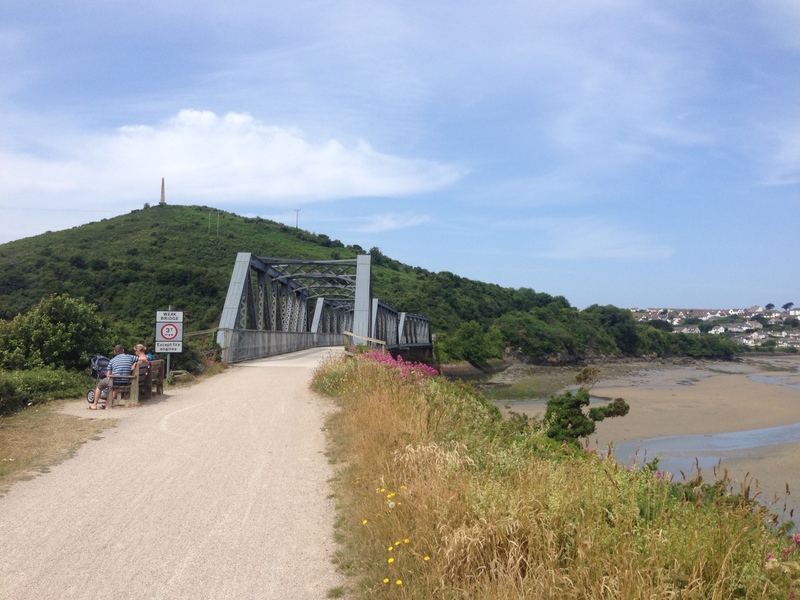 I pedalled on to Looe, via a slightly roundabout route due to bad map reading skills and warren like roads…again. There’s a bridge over the river at Looe, rather than a ferry, which I crossed before heading up the A387, intending to join the B3253. Unfortunately the B3253 was closed so I had to take the long way around, continuing inland on the A387 over rolling hills on my way to Torpoint. 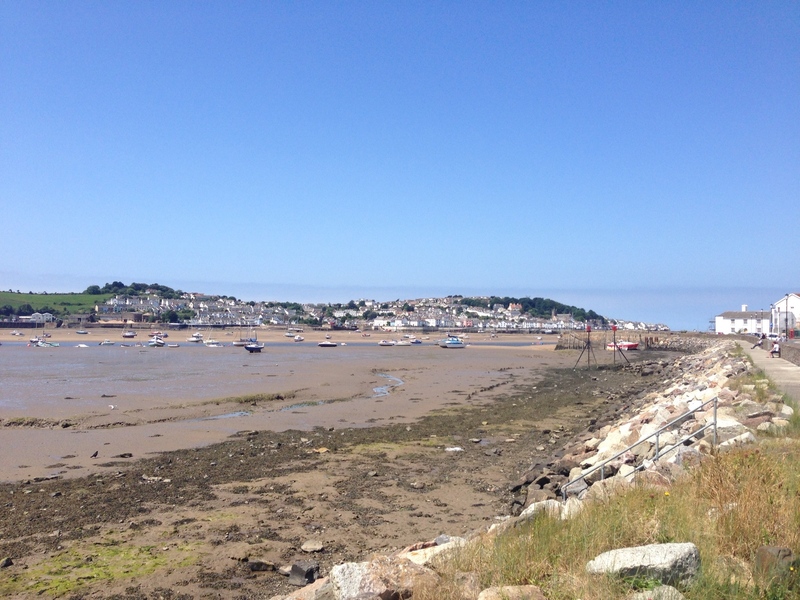 After a lovely ride through more great countryside, and waving to several other cyclists, I made it to Torpoint. I was impressed with my stamina today, my legs seemed to be working well taking on one hill after another without too much trouble. 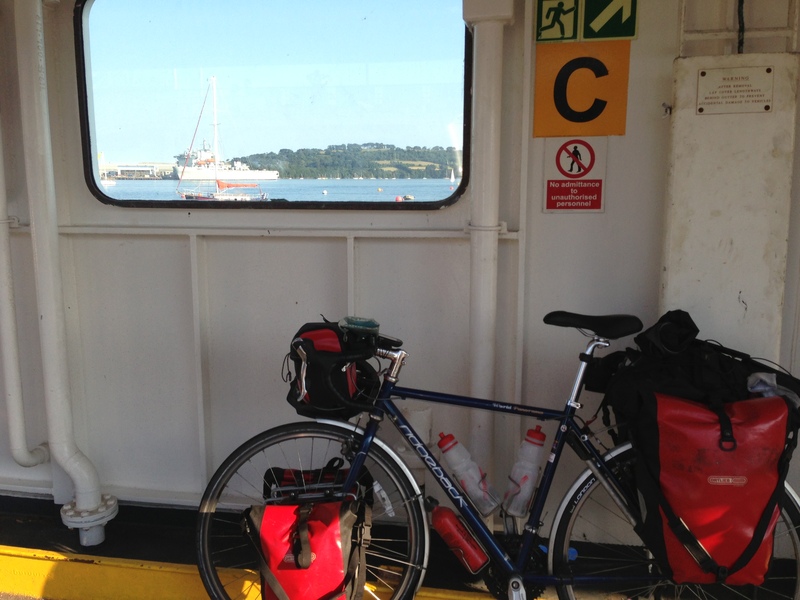 I met another cyclist whilst waiting for the chain ferry across to Plymouth, who advised on the protocol for boarding. The ferry is free for cyclists, and seems like a far better option than tackling the busy main road which runs further inland around the north side of Plymouth. Chatting to the fellow cyclist on the way across I learned she worked for the Department of Fisheries, so I asked her what she thought of Hugh Fearnley-Whittingstall. She agreed that he’s done some great work in challenging the fish discard rules, but needs to be careful with some of his more recent Fish Fight campaigns which could just result in putting honest fishermen out of work; as always it’s important people follow expert advice and not just reckon one knows best. I feel quite passionately about giving the oceans a chance to recover, and banning irresponsible fishing techniques, but like everything you need to know the facts to make an informed argument. 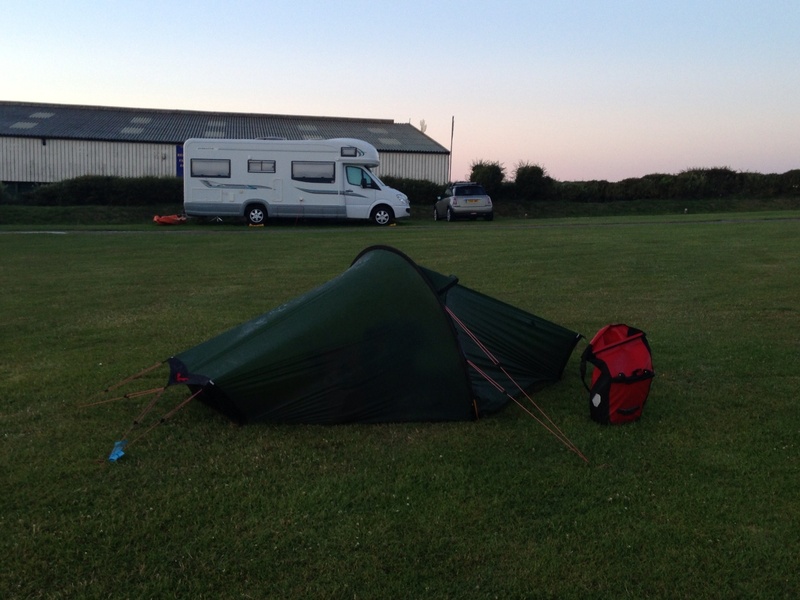 She also recommended a good campsite, just on from Plymouth in Newton Ferrers. There was allegedly a very nice pub in the village, so I decided to take her advice and head there for the evening. Where a nice pub is concerned I don’t need a lot of convincing. Riding off the ferry at Devonport I successfully negotiated Plymouth and some pretty intense traffic, heading for the A379. There are several cycle paths running alongside the road which I was able to take advantage of. These are great aside from when cars decide to park in them. I was cycling along minding my own business, well actually I was looking down at my map trying to work out where I was, when I looked up to see the rear end of a Volvo estate a couple of metres in front of me. Unable to stop in time, but taking the edge off my speed by slamming on my brakes, I smacked into the back of it. I didn’t go over the handlebars, but did end up on my cross bar, and my rear panniers came off in the impact. It would have been a lot worse if I hadn’t looked up. Unfortunately I bent my front forks in slightly, meaning my fuel bottle would no longer fit in its cage without interfering with the front mud guard. I think my front wheel was bit battered too, not to mention me. After relocating my fuel bottle and reattaching panniers I was able to continue. The Ridgeback proved its toughness by not being otherwise adversely affected, as far as I could tell anyway. The Volvo was of course completely unharmed in the altercation. There was no-one in it at the time, and whilst it’s a bit annoying to have someone stopped in the cycle lane it wasn’t illegally parked, so it was completely my fault. With a slight case of bruising in my nether regions I continued on out of Plymouth via Pomphey, taking the bridge over the River Plym on to the A379. I turned right at Yealmpton, on the B3186, down to Newton Ferrers and tackling the last hills of the day with my bike still running well despite the collision. I arrived at Briar Farm campsite as afternoon turned into evening, quickly pitching my tent and heading down to the pub to find something to eat. Newton Ferrers is a pretty village, and evidently home to quite a few people with a lot of money, there being a yacht club and expensive looking houses. There’s one shop where I was able to buy a few supplies for the morning. 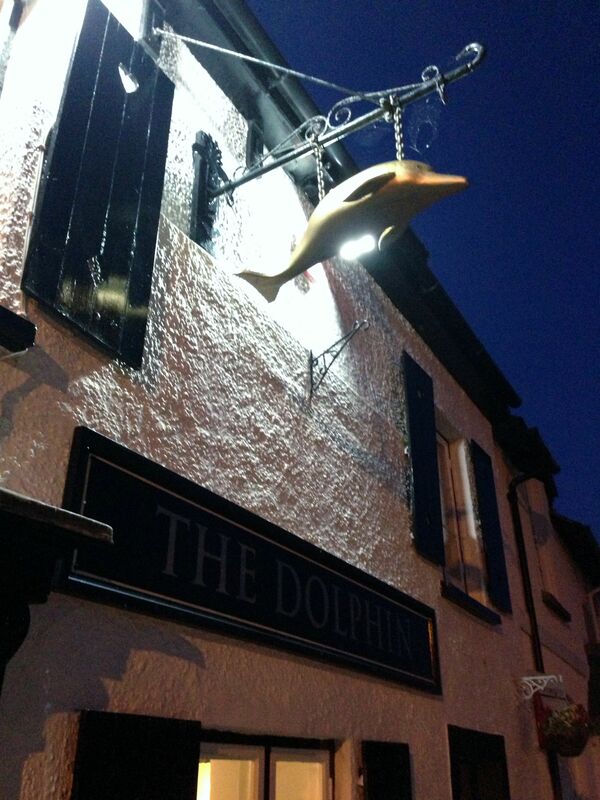 I met the campsite owner in the Dolphin Inn where apparently he spends quite a bit of his time, so paid the £7.00 site fee, before enjoying the food that had been laid out for the pub quiz. I’d arrived a bit late to participate in the actual quiz, however they were quite happy for me to finish up some of the food, which I proceeded to do with some gusto over a couple of pints. It was a thoroughly enjoyable evening, listening to the quiz whilst chatting to Ed the bar manager. Newton Ferrers was the birthplace of the famous pirate Henry Every, who plied his trade in the late 17th century in the Atlantic and Indian oceans. He was never caught and retired very rich, somewhere unknown, inspiring others to take up the pirate way of life. I was somewhat amused to hear one of the younger patrons talking to her friends about her busy day planned for tomorrow. She needed to visit the solicitor to sign the papers for the house daddy had bought her, alright for some. 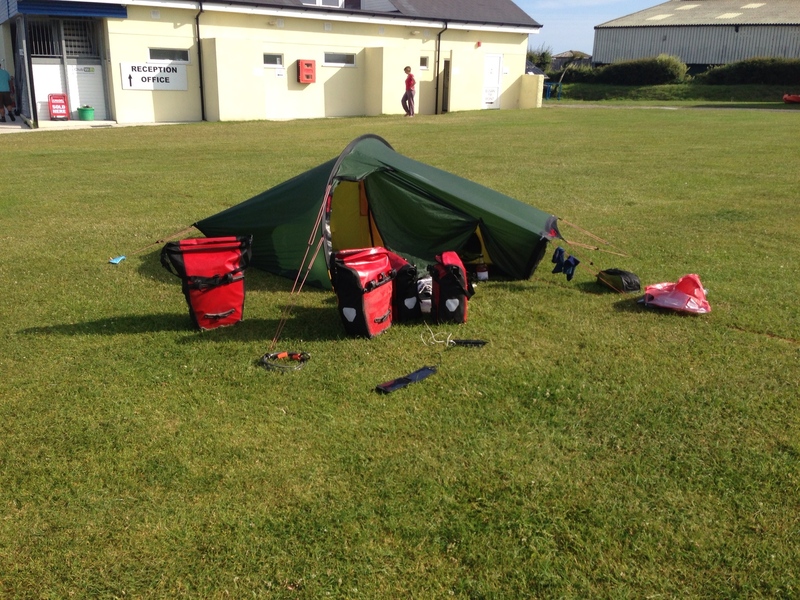 After a great day encompassing 4 ferries and some beautiful coastline and countryside, a long with my fair share of hills, I retired to my tent ready for sleep. Tomorrow I planned to head for Torquay to stay with friends, Chris and Sam, which meant more ferry crossings and more steep climbs. Bring it on. This entry was posted in Bike around Britain 2013 and tagged adventure, bicycle, bike, Bike around Britain, charity, Cornwall, countryside, cycle, cycle touring, cycling, Devon, expedition, Falmouth, Fowey, fundraising, Helford, outdoors, photos on September 17, 2013 by SelfPropelled. After a very chilled out evening at Sundowners I was somewhat reluctant to surface, however the heat eventually drove me from my tent into a cool northerly breeze. 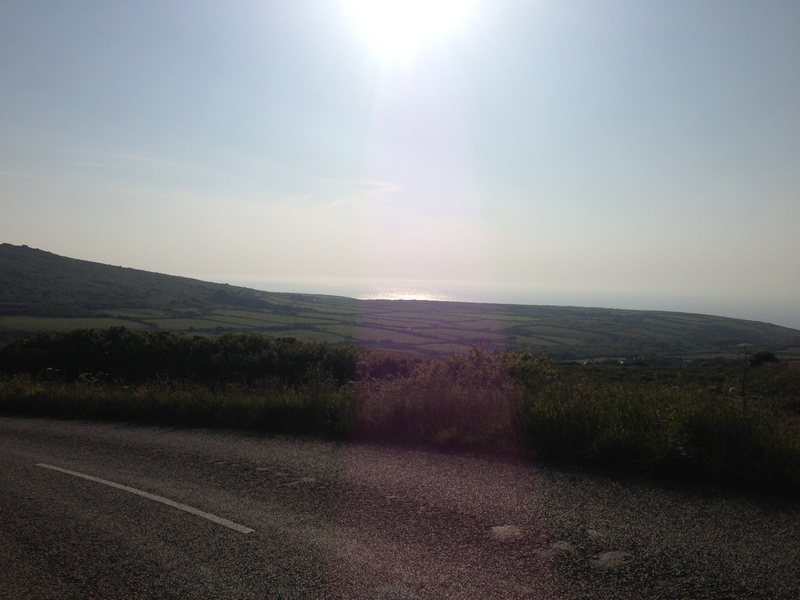 It looked like it was going to be another hot day for the pedal towards Land’s End. I had a shower and packed up, loading up my bike and heading back to Sundowners for breakfast. I’d been reliably informed by Matt that it would be just what I needed to get over the Cornish hills today. Breakfast was large, very large. I chose the Sundowners special which consisted of 2 sausages, 2 poached eggs, bacon, beans, mushrooms, thick cut toast, and a pile of pancakes that follow a recipe Matt has perfected over a number of tasting session. 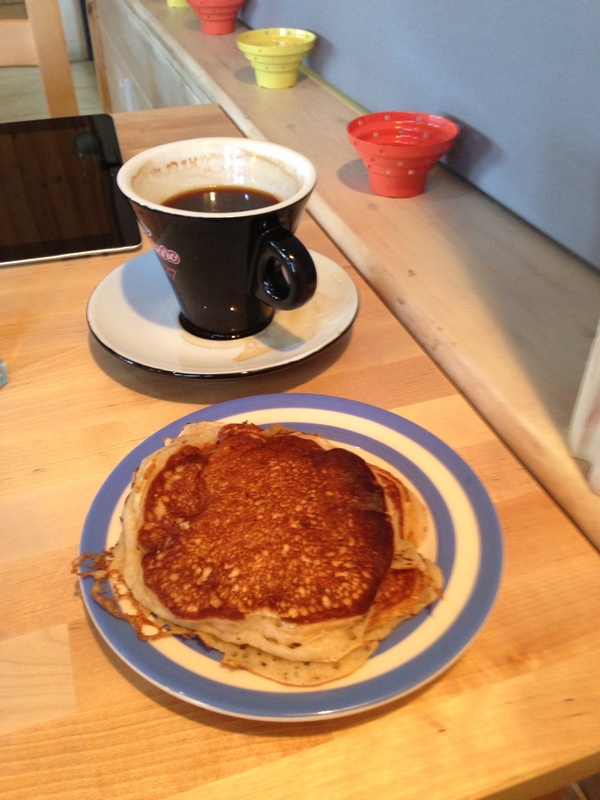 The pancakes were delicious, as was the whole breakfast, although I could perhaps have squeezed in some black pudding too. I could have quite happily hung around the bar and Polzeath for the day, having a rest and eating more pancakes, however Land’s End was beckoning. Bidding Matt and Sundowners adieu I rode down the hill to the village of Polzeath, which I still can’t pronounce right. 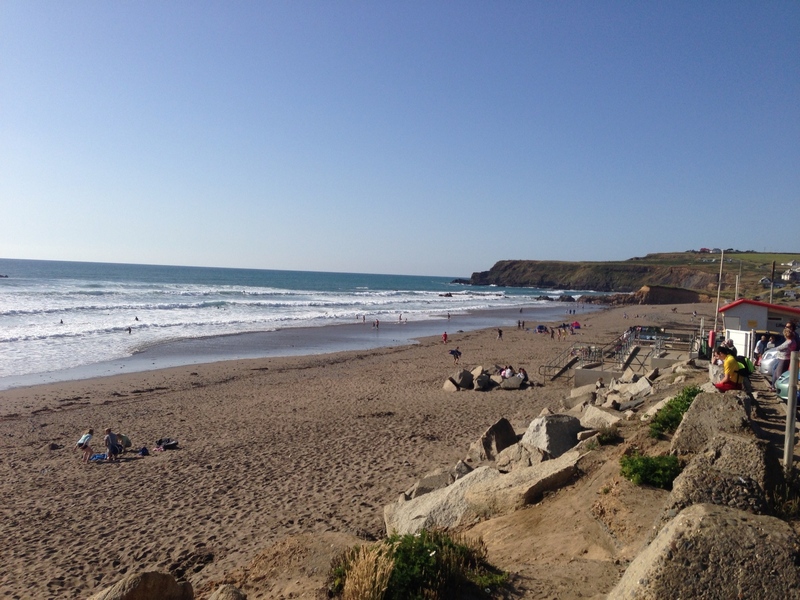 It was very busy with beach goers, including a lot of surfers. It looked like a good day for surfing, with a decent swell. From Polzeath I cycled down down country roads, past the turning to Rock which is allegedly quite posh. I had to squeeze past several expensive cars, including a number of Chelsea tractors who showed little in the way of consideration for a laden cycle tourer, meaning I had to get friendly with the hedgerow a few times. I have a deep suspicion that a lot of people owning these huge 4x4s can’t actually cope with their size or drive them very well. 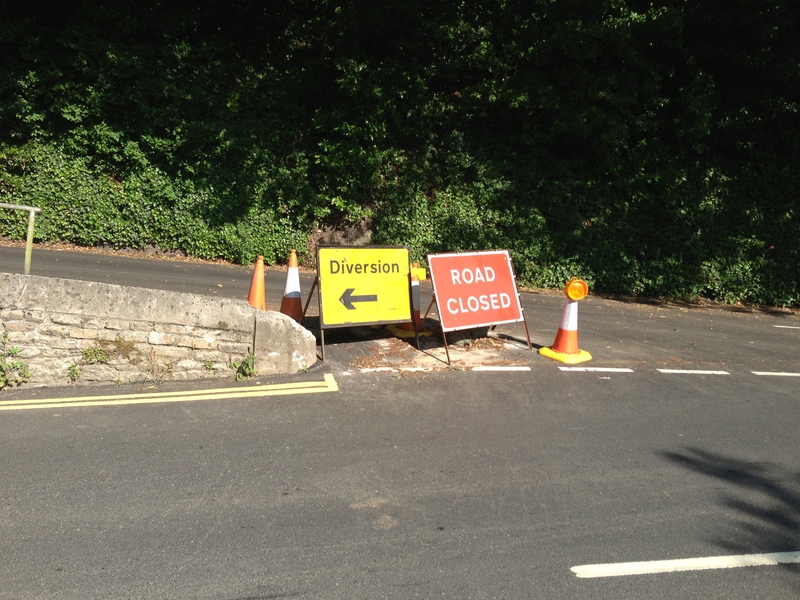 When it comes to manoeuvres such as reversing, or knowing where the edges of your vehicle are on narrow roads, they panic and just sit in the middle of the lane until the person coming the other way does something. It’s quite interesting when you get one coming from either direction, with neither willing or perhaps able to get out of the other’s way. In one such situation I quickly slipped by before the stand-off got ugly. 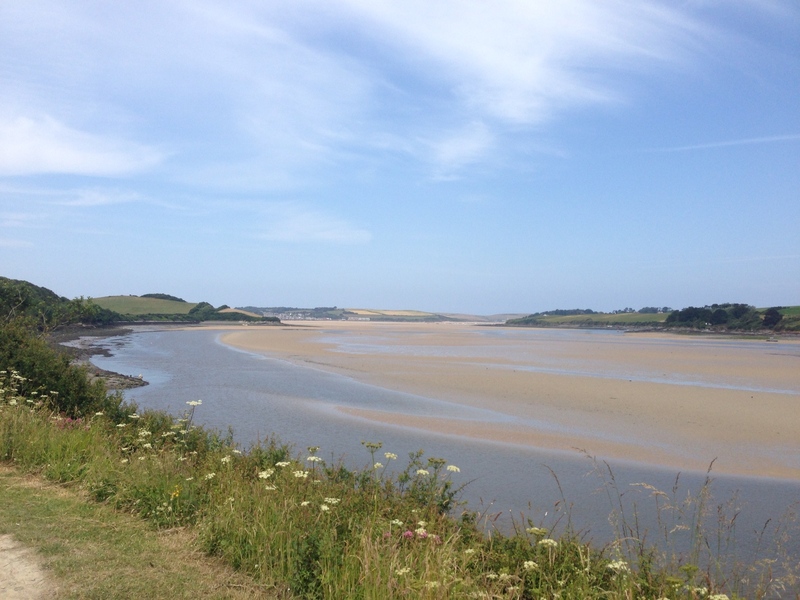 I crossed the River Camel into Wadebridge, then rode down the Camel Trail to Padstow. 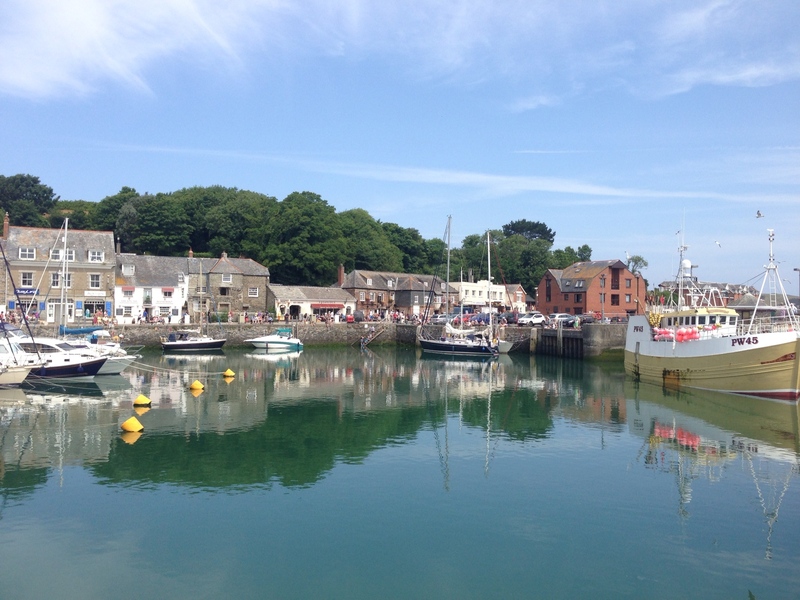 It’s about 5 miles on the trail to Padstow, or Padstein as it’s often called nowadays due to the influence of the famous local chef Rick Stein. The popular cycle track follows the course of another old railway line, alongside the river through some lovely scenery. It being Sunday and gorgeous weather there were loads of cyclists out. You can hire bikes at either end of the trail as Nadia and Simon had done, two of my friends from Norwich, just a couple of weeks earlier. They took their son Yared on his first cycle trip down the trail, although being a baby he was only a spectator and probably slept for most of it. It was Nadia’s first outing on a bike, or a trike in this case, in a long time, and she got a puncture; should have insisted on Marathon Plus’. Well done for getting out there though! 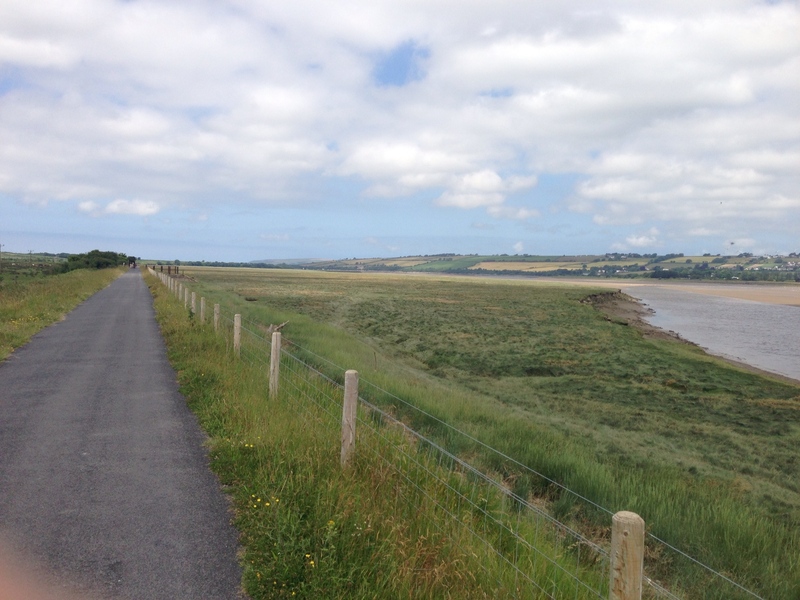 I think the Camel Trail was the only flat bit of the day’s ride, however it was so packed I got caught in traffic a few times and was glad to reach Padstow. Latterly I came across two kayakers out on the river having a rather tricky time of it. They’d obviously misjudged how deep the water was going to be, and with the tide out their kayaks were grounded. There was really nothing anyone could do to help them, they were just going to have to get out and push. I left them to it hoping there was no sinking sand about. 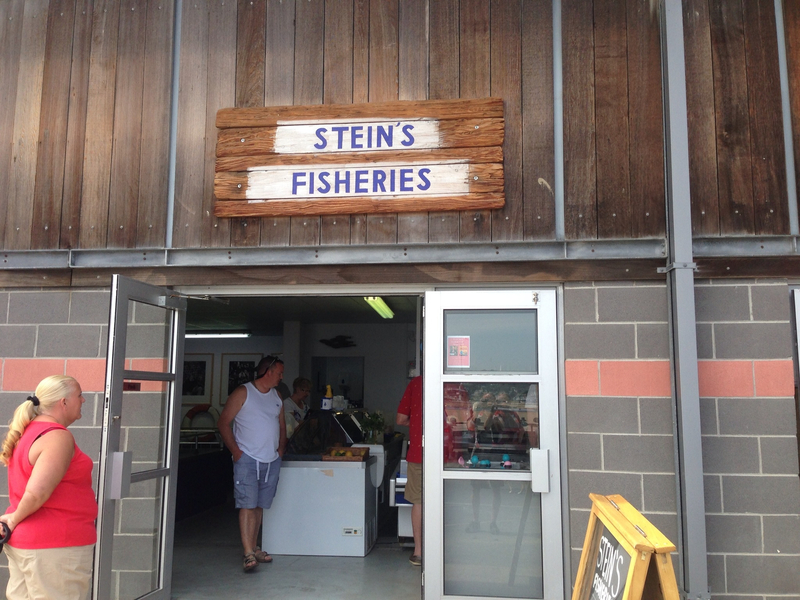 Rick Stein has several restaurants in town, most beyond the budget of a humble cycle tourer. Lu and I had fish and chips from his shop when we visited, and whilst I was tempted to repeat the experience it was still a bit early, and I was still pretty full after my huge breakfast. 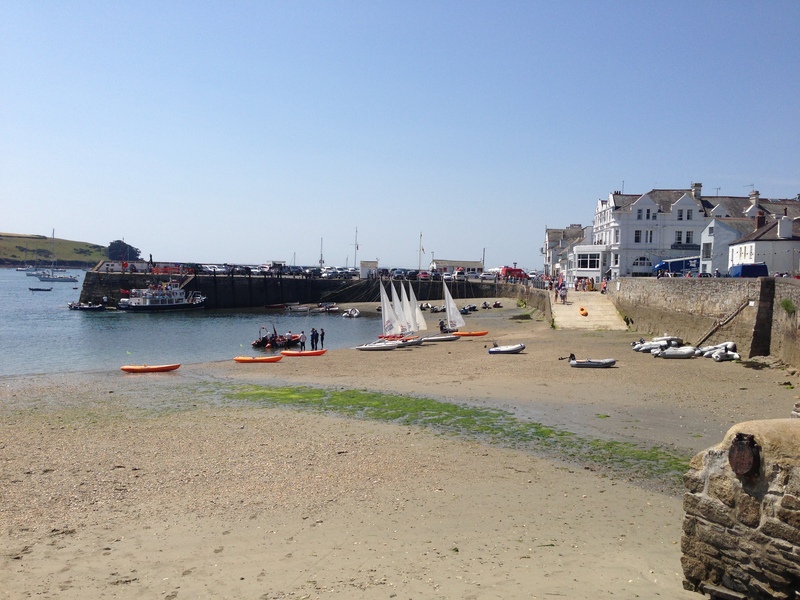 Instead I had a stroll about and bought a cold drink and some flapjack, the latter for later, down by the harbour. 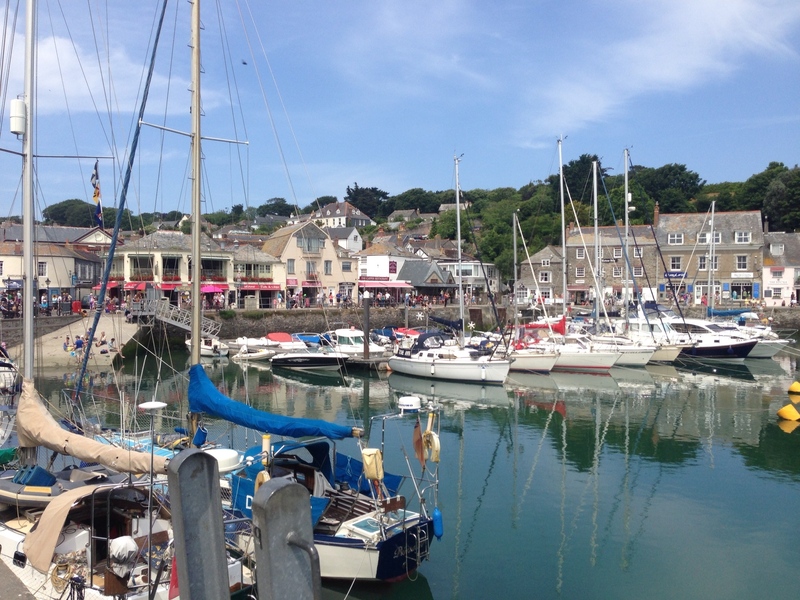 Padstow was really busy, thronged with holiday makers, however it was nice to pause and cool down a bit. A random passer-by stopped for a chat as I was sitting by the harbour, intrigued by what I was up to with all my panniers and slightly dishevelled appearance. We had a quick chat after which he offered me his garden to pitch up in, should I be passing at the right time of day. He lives near Exeter so it could’ve worked as I pedalled up the south coast. 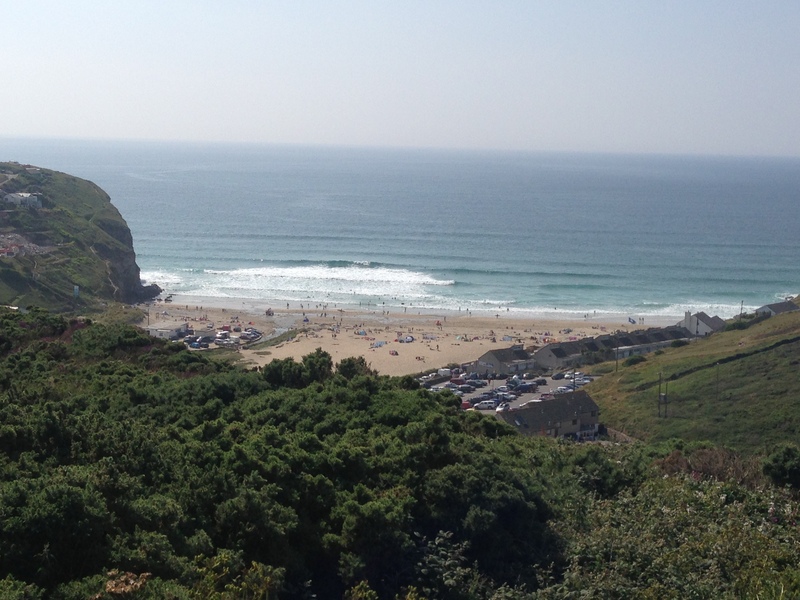 I pedalled up out of Padstow and into the Cornish hills, then down the coast to Newquay. 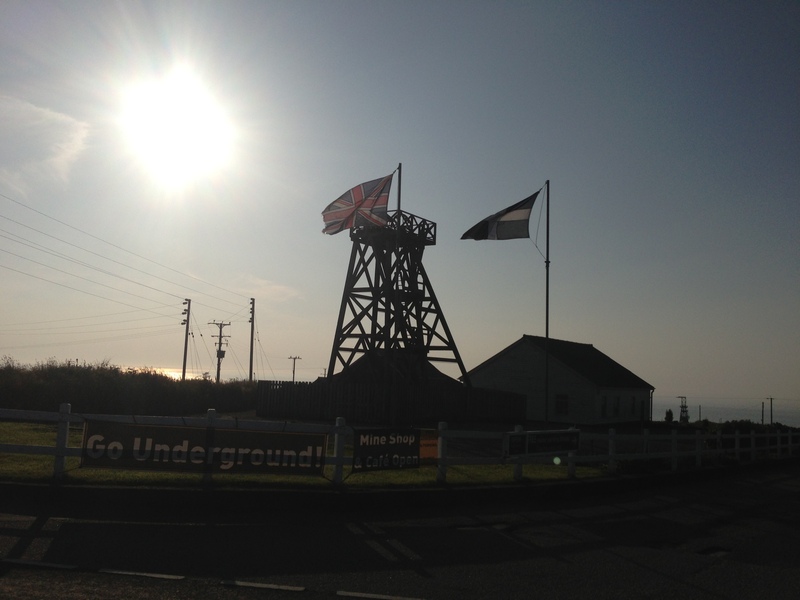 I didn’t stop in Newquay, not wanting to get embroiled in the town. As mentioned before it’s a bit grotty these days so I continued on my way. My speed today was low, perhaps averaging only 10 miles an hour due to the hills and tired legs. I was however thoroughly enjoying the ride along the north coast of Cornwall, taking in some great views and feeling in holiday mode. 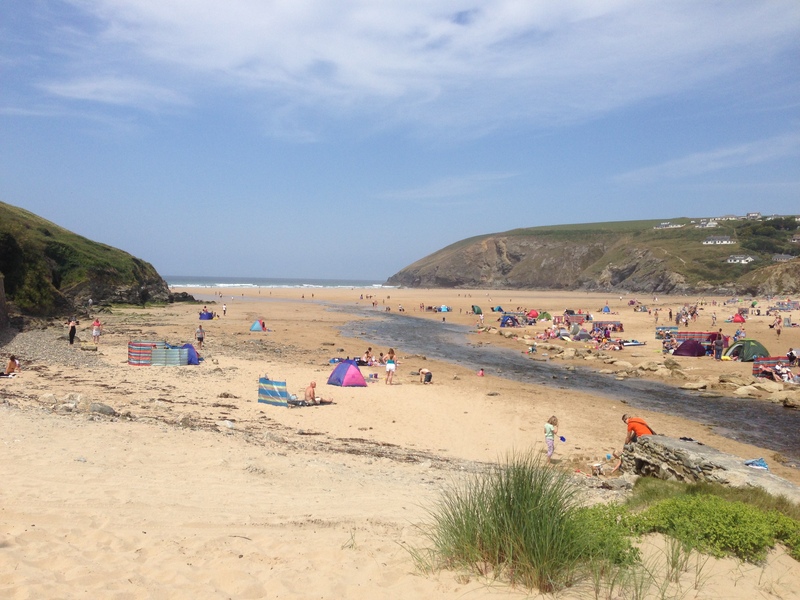 I rode through Perranporth passing another gorgeous and packed beach. I noticed there were lots of mini tents on the beach, presumably to give people somewhere to get changed, and for infants to get some shade from the sun. Are these a new thing as I can’t remember seeing so many before? The beach was packed beach goers, either laying in the sun, surfing, playing ball games or building sandcastles, all good fun. 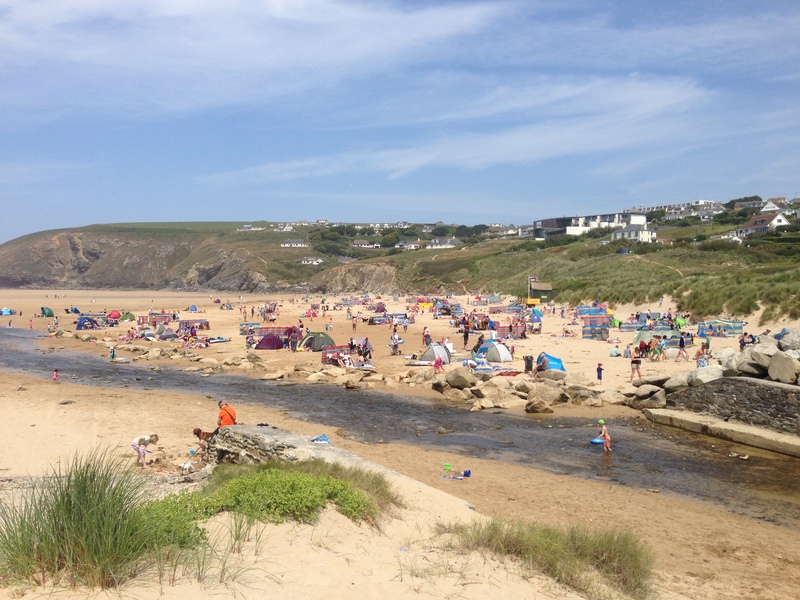 From Perranporth I rode up a steep hill and down a bit of a windy road to St. Agnes, passing through the picturesque village before reaching the cove and beach, which funnily enough was also packed with holiday makers. It’s a lovely spot and somewhere I hadn’t been before, so I decided to have a break, it being about 15.00 and well past lunchtime. I found Breakers Cafe, as recommended by Matt, and consumed a tuna melt panini with a cold drink, whilst watching the surfers and body boarders enjoying the waves. The sea looked very tempting, however I still had miles to go and didn’t want to get sand in places sand didn’t need to be – not good when cycling. Whilst it was lovely today the cove is a completely different environment during a storm, as evidenced by a picture on the wall from a few years back, which showed huge waves crashing into the cove and the front of the building. Apparently the waves were so fierce buildings were damaged and anything not tied down washed away. In fact a load of surf boards that had been tied down weren’t there any more after the storm had passed. After refilling my empty water bottles at the cafe I was ready to go again, setting off back up the hill through St. Agnes. It was so hot today I was going through water very quickly, so the refill was well timed. The melodic strains of folk music greeted me from outside the attractive village pub, where a live band was playing; what a lovely way to spend a Sunday afternoon. The experience was repeated several times during the course of the day, with lots of bands playing in pub gardens. Sticking to the coast I pedalled on to Portreath, Gwithian, and then around St. Ives Bay to Hayle and St. Ives itself. My legs were really starting to ache from the constant climbs, which I seemed to spend the majority of my day tackling, the downwards stretches not taking very long. 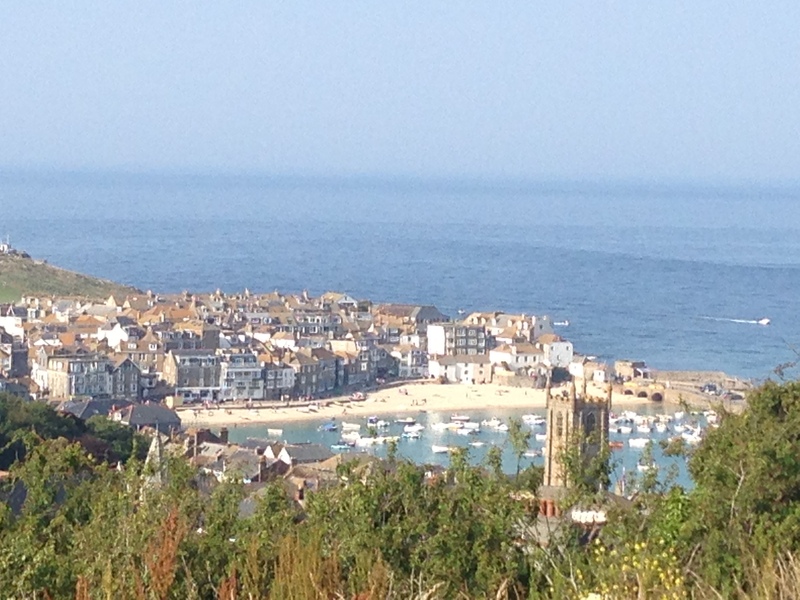 With time ticking on I paused briefly in St. Ives to eat an energy bar (Bounce), and then set off on the B3306 to St. Just. I really am going to have to get better at holding my phone straight when I’m taking pictures – another wonky horizon! The coast road wound up and down hills along the beautiful Cornish coast, and through places familiar from childhood holidays and the more recent trip down here with Lucy. I passed a sign to Paradise Park, somewhere my brother and I had loved visiting as children. It’s a large wildlife sanctuary, with lots of tropical birds, although the we liked the birds of prey more than anything else. Good to see it’s still going strong. 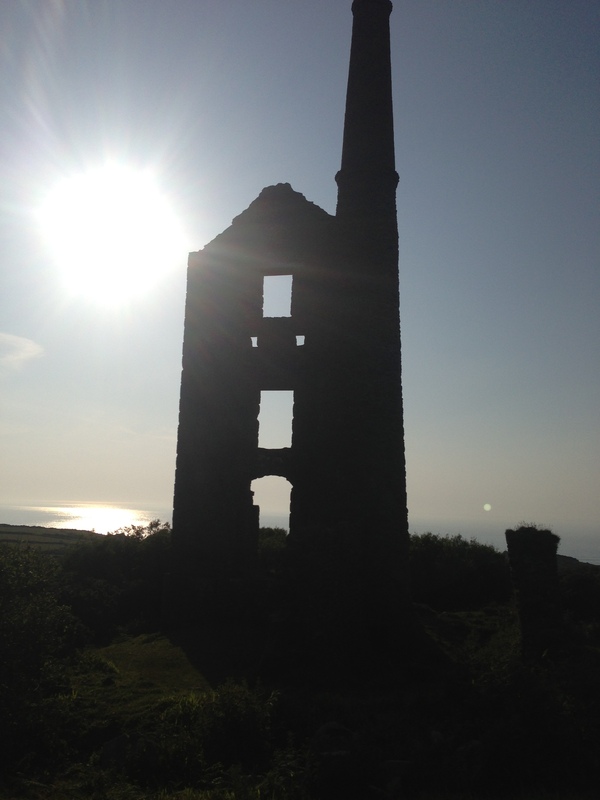 I rode through Zennor and on to Pendeen, site of the famous Geevor tin mine. Tin has been mined here for thousands of years. 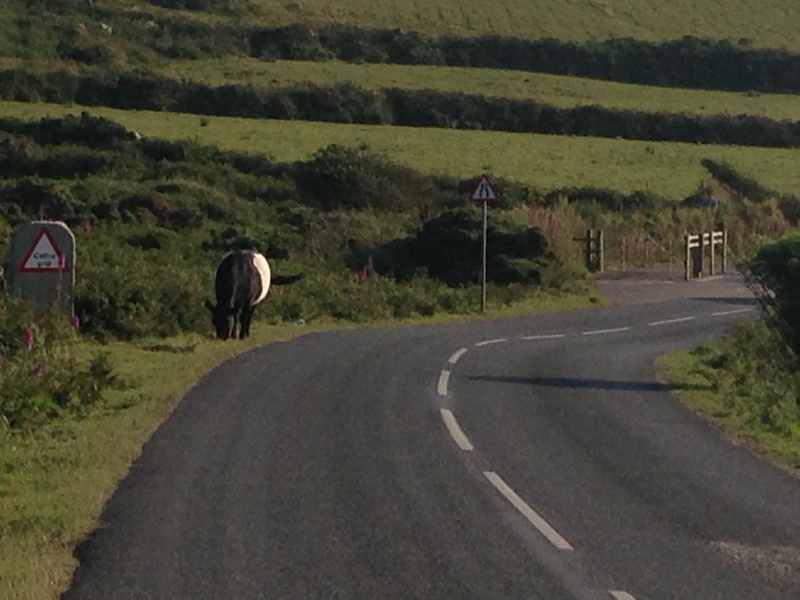 I passed a cow by the road side. They always make me slightly nervous due to their tendency to start following me as I cycle past. I still haven’t worked out why they do this, maybe it’s my red panniers. In any case this particular bovine was fairly docile and left me alone. From Pendeen it was a short ride to St. Just, where I paused to buy a few supplies for dinner. Despite it only being a couple of miles to my destination I had to have a break to try and get some energy back, drinking some chocolate milk from the Co-op, and topping up with a banana for good measure. I finally made it over the last few hills to Trevedra Farm campsite, arriving about 20.15. Reception was closed but I’d called earlier and they’d said just to pitch up and we’d sort out paying in the morning. 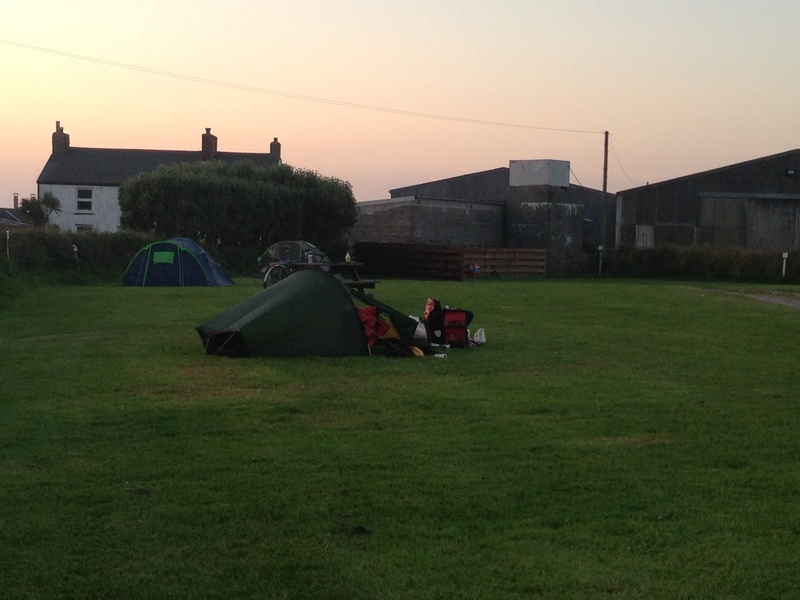 I got my tent up as the sun started to disappear, then settled down to the serious business of eating. Following a large pork pie, houmous and pitta bread, fruit and chocolate, I was feeling a lot better, especially after a couple of beers. I called my parents to report that I was almost at Land’s End, and learned Andy Murray had won Wimbledon, excellent news. 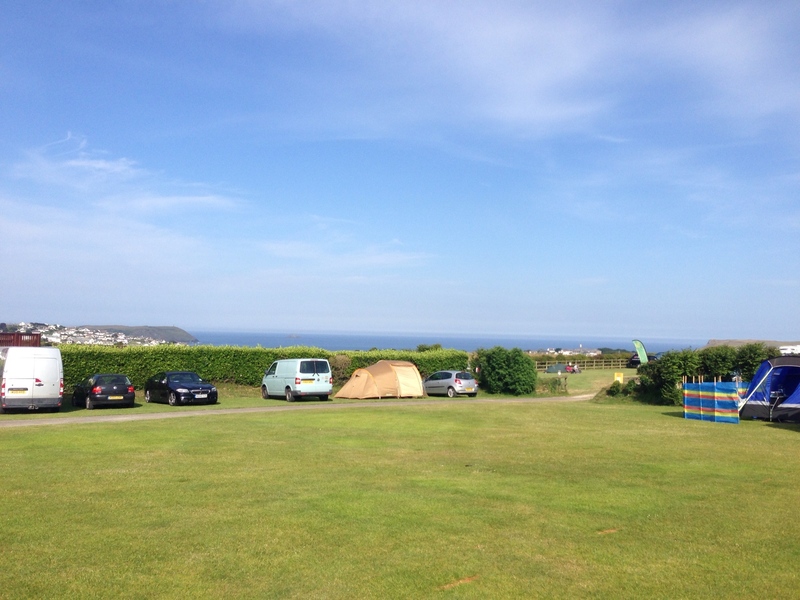 The campsite overlooks Whitesand Bay which runs around to Sennan, and I could see the Longships Lighthouse off the coast from Land’s End. I grabbed another beer and sat in the grass watching the sun go down. I was hoping to see the ‘Green Flash’, which is allegedly more visible from here. Mr Worth, the father of one of my Mum’s friends from University, fished the waters off the Cornish coast for many a year, and reported seeing it one several occasions. It’s a phenomenon only visible for a few seconds at most, as the sun sets. I didn’t see it this time around, however the sunset over the Atlantic Ocean was glorious in its own right. It had been a good day’s ride, covering around 82 miles and bringing my total close to 4,500. The route tomorrow would take me to Land’s End, another milestone, and on to the Lizard, the most southerly point on the UK mainland. It might even be a bit flatter after today’s hills, however I wasn’t convinced. I’d got a bit sunburnt today due to sun-cream just sweating off in the heat, so would have to keep an eye on that lest I end up looking like Rudolf. After the sun had gone down I gazed up at the stars for a bit. The sky was amazingly clear, and with little in the way of light pollution I could quite clearly see the milky way. It’s times like these when you can end up feeling remarkably small against the backdrop of the Universe. Feeling pensive I retreated out of the north wind, which was chilling things off. I was very tired after the day’s exertions, and somewhat emotionally drained too. I kept falling asleep as I tried to write up my journal, so gave up in the end, drifting quickly off into a deep slumber. This entry was posted in Bike around Britain 2013 and tagged adventure, bicycle, bike, Bike around Britain, Camel Trail, charity, Cornwall, countryside, cycle, cycle touring, cycling, expedition, fundraising, Land's End, outdoors, Padstow, photos, Polzeath, Sundowners, sunshine on September 12, 2013 by SelfPropelled. – 4,352 miles covered by close of play today, with about a 1,000 to go. I was up early to another day of sunshine, so got breakfast, bike checks and a shower out of the way quickly, before packing up. I headed to reception to drop off my toilet block key and get my deposit back, and to do some planning via my iPad; they have free wifi around the reception building which is handy. 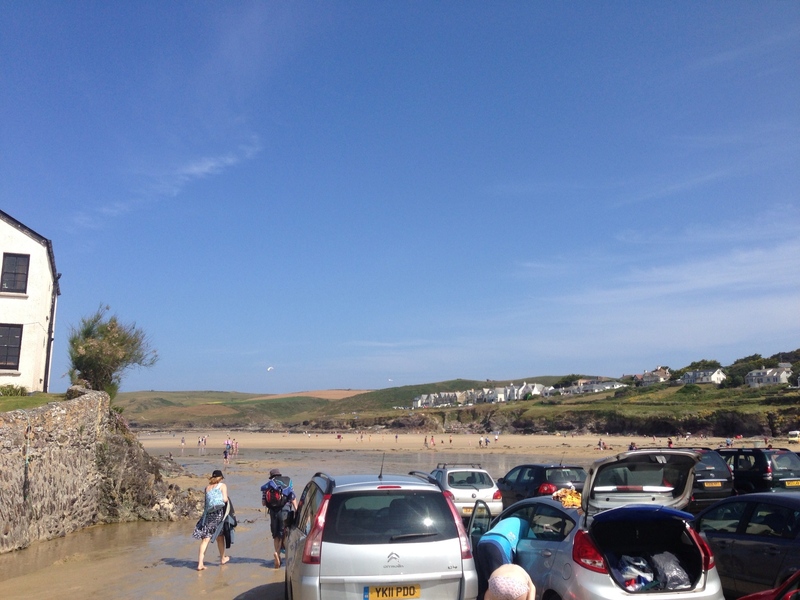 Polzeath looked like a good destination to head for today, and the Southwinds campsite, so I gave them a quick call to book in just in case they got busy. It was only £7.00 for the night so good value compared with some. Before leaving the campsite I met up with Mum and Dad, who returned my phone fully charged, and donated some homemade cookies to the cause – all calories gratefully received. It had been great to see them and I waved them off as they departed for home in East Sussex. All being well I’d be seeing them again in a couple of weeks anyway. I bid goodbye to the Hele Valley Holiday Park and their wonderful staff, who also made a donation to the Big C, thank you! Ilfracombe was my first destination, only a mile down road. It was pretty busy with a lot of traffic and holiday makers, so I cycled straight through and out the other side, only stopping to use a handy cash point, and to take a pretty uninspiring photo as I realised I’d forgotten to take one at the campsite. Next up was a steepish ascent, followed by a long descent down to Braunton. 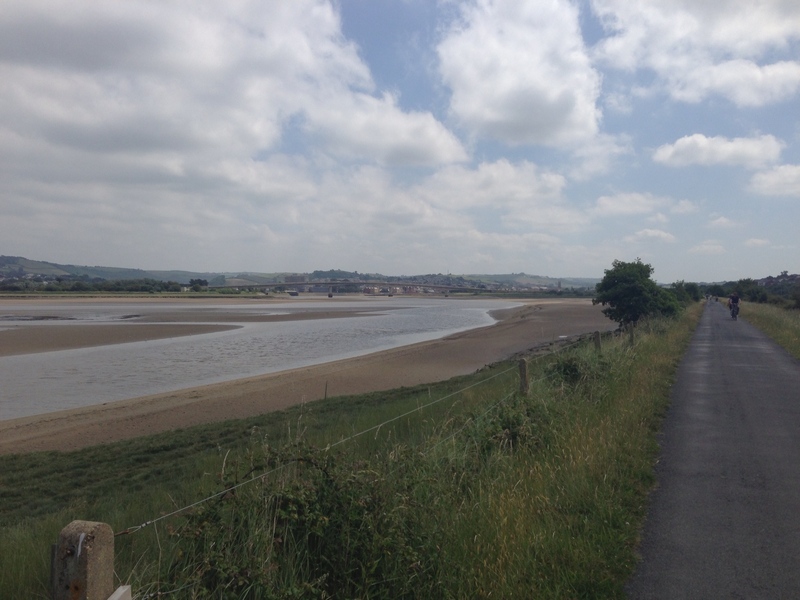 I was able to take the cycle path for some of it, arriving in Barnstaple after about an hour and a half of pedalling in perfect weather. 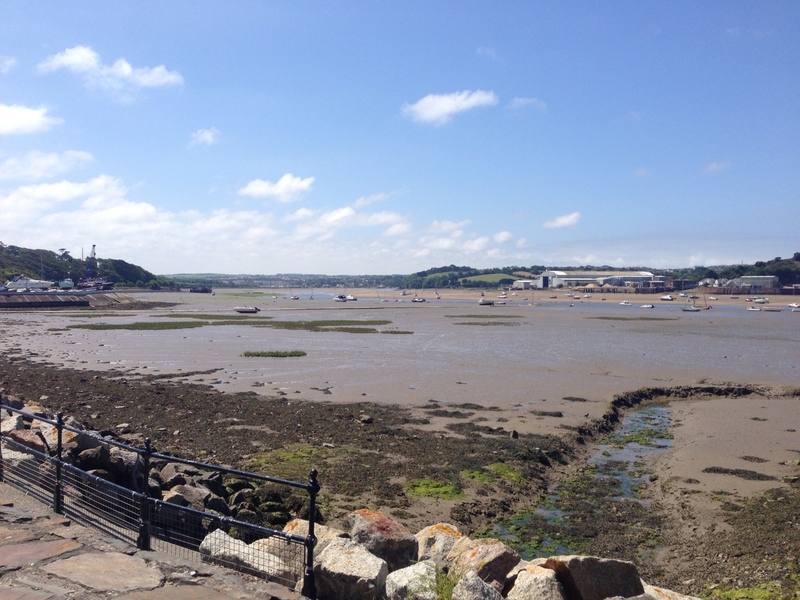 I had a quick walk through the town before picking up the Tarka Trail down the coast. It’s a tarmac’d cycle path running, as so many do, along the route of an old railway line. There were a lot of other cyclists and walkers out in the sunshine, including a large group of girls on a hen party. They looked like they were having a lot of fun, although they freely admitted they were making pretty slow progress due to stopping for frequent breaks. I’m not sure their dresses were best suited for cycling, very entertaining though. I bid the girls goodbye and sped off down the trail, before coming to a rather abrupt halt after I heard a distinctive pinging noise. The wheel destroying Spriggans were at work again, resulting in another broken spoke, and on the drive side this time which I couldn’t deal with; the cassette is in the way, I didn’t have the right tool, and I didn’t have any spokes of the correct length anyway. The wheel had immediately buckled, and pretty badly, so I pulled over to do what I could to temporarily fix it. Of course the hen party passed me shortly afterwards, which was slightly embarrassing after I’d zoomed off. To fix the buckle in the wheel I had to tighten the spokes either side of the break, and slacken off a few on the other side. The rim had also developed a bit of a flat section which didn’t help matters. All in all it was looking like it was well and truly b*ggered, but I managed to get it into a state where I could continue, hoping there was a bike shop that could rectify matters in the next town along. I was reasonably concerned about how I was going to get this fixed as I limped to Bideford, crossing the old bridge over the River Torridge into the town. Using my phone I located a bike shop that stocked Ridgebacks, and was also a specialist. Fortune must have been smiling on me. Cycles Scuderia was completely on route on my way out of Bideford, and I quickly found it, interrupting Malcolm the owner and his wife as they were having lunch. After discussing the symptoms and conducting a preliminary exam of the patient Malcolm reckoned he could fix it. The flat section in the rim, as well as some of the spokes being slightly different lengths (I’d been sold shoddy spokes somewhere) meant a complete rebuild was needed. Patching it up would have just meant more spokes breaking at any given moment, but the good news was the wheel could be saved. This was especially fortuitous as he didn’t have any spares in stock. The nearest alternative shop would probably have been in Wadebridge which was miles away. It was a busy Saturday in the shop, and they had customers backing up with new patients arriving all the time, so I was a extremely grateful that Malcolm was able to fit me in. Whilst the operation was in progress I retreated over the road to a cafe in the park, to get out of the way and grab some lunch while I had the chance. The Cafe du Parc is run by a group of French chefs, who did me a great cheese and pâté platter. After a hectic and worrying morning it was good just to sit down and relax for a while, waiting for the outcome of surgery. I sat in the sunshine for a bit talking to my brother on the phone, before heading back to the shop. Fortunately the operation had been a success, Malcolm having been able to rebuild my wheel. The flat section had popped out during the procedure and I now had a hand built wheel with new spokes, which I shouldn’t have any further issues with on the tour. From now on it will be hand built wheels all the way, it’s just not worth getting factory built ones which won’t last with all the weight on the bike over a long distance. The cheaper spokes they use in the factory built versions will break after a while, and after one’s gone more are likely to follow, like a zip undoing. That was probably the best £47.00 I spent on the tour, thanks Malcolm and Cycles Scuderia. Bike back to fully working order I was ready to go again, but stopped briefly to chat to another customer who was on his way from Land’s End to John o’ Groats on his new Dawes tourer. It was his first tour and his gears had seized up, so needed Malcolm’s expert ministrations. He advised the roads ahead were hilly but good. I advised the roads ahead were much the same, and to beware the wilds of Wales if he was passing that way. And sheep, always watch out for the sheep. I pedalled out of Bideford feeling somewhat relieved, however having spent 3 hours getting my wheel fixed I needed to make up some time. To get some miles done I took the A39 around the coast, up and down the rolling hills of Devon, before passing into Cornwall and reaching Bude, where I took a slight detour. Bude was very busy with holidaymakers going to and from the beach and enjoying the various pubs, the river looked a bit manky though. 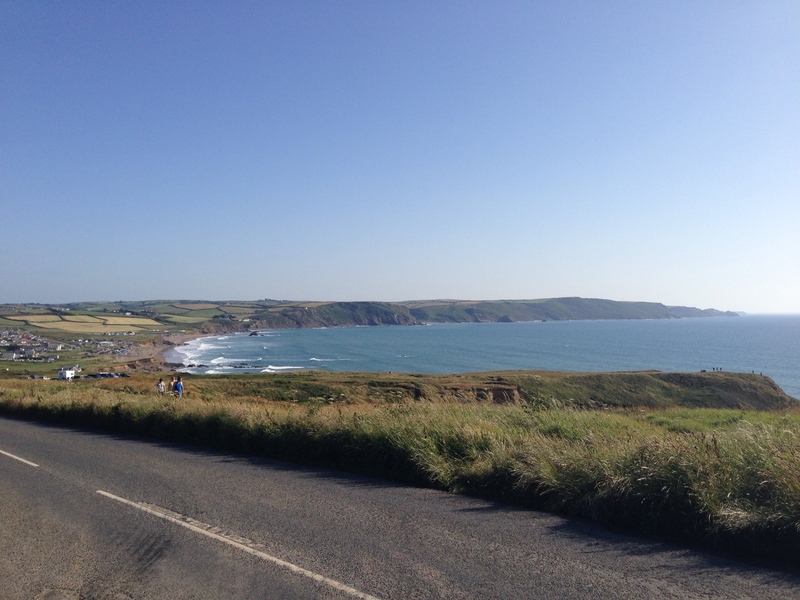 I rode along the coast road, Marine Drive, to Widemouth Bay which was a lot nicer, and a big spot for surfers and body boarders. I stopped for an ice cream to celebrate everything being in working order, and still being on track despite mechanical failures. 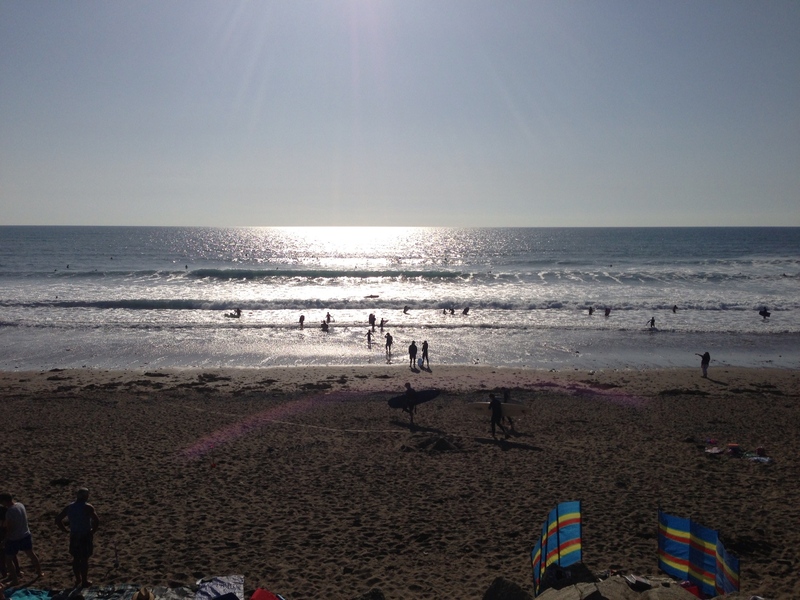 Widemouth Bay 3 – photo needs straightening! Post Widemouth Bay I rode around to Boscastle, ignoring Crackington Haven this time around as it was a dead end, with big hills that I didn’t really have time for after my sojourn at Cycles Scuderia. In any case there were plenty of hills to keep me entertained as I pedalled down the A39, then on to the B3263. 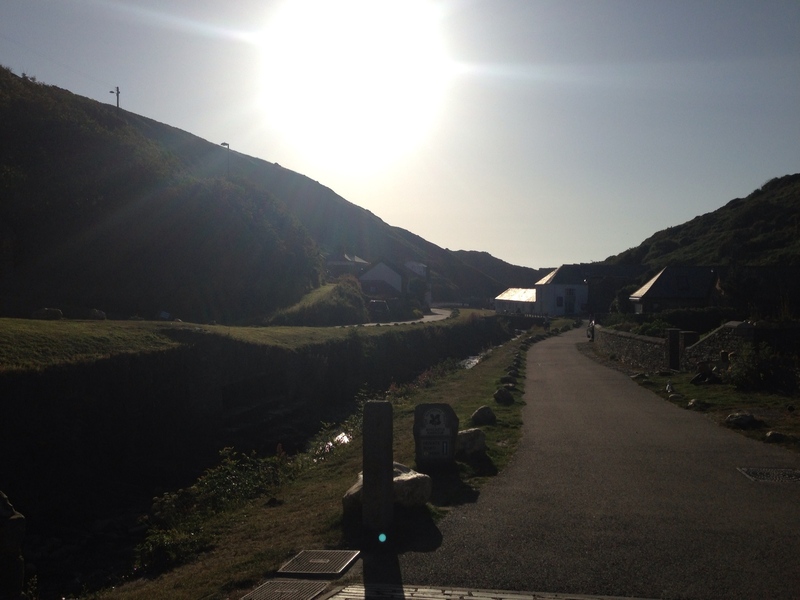 Boscastle is another picturesque village, and home to the museum of witchcraft which sounded intriguing was closed by the time I passed through. 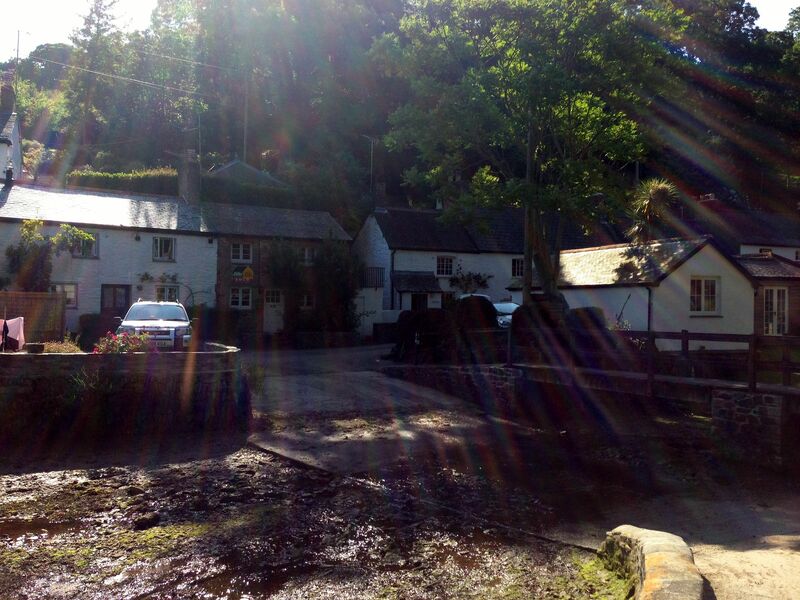 The village was badly flooded in 2004, and to a lesser extent in 2007. I remember seeing pictures on the news of people being rescued by helicopter, and of cars being washed down the river. Luckily no-one was killed but looking at the gorge you can see how the river gets funnelled down to the village, and how it could flood in extreme conditions. You can also see the high water mark from the floods, pretty scary. There was another hen do out in Boscastle, all dressed in pink and sounding pretty raucous, also pretty scary so I gave them a wide birth. I rode on to Tintagel, somewhere I’d explored thoroughly with Lu several years ago. I stopped at the top of the path going down to the castle, which we’d visited at the time. Looking out over the bay I remembered a great holiday, although Lu hadn’t been too keen on the camping side of things. I’d be passing through a lot of the places we’d stopped at back then, so there’d be a lot of happy memories to come. Of course Tintagel Castle is also one of the places that could potentially be the site of King Arthur’s Camelot, if such a place ever existed, or is strongly associated with a lot of the stories anyway. 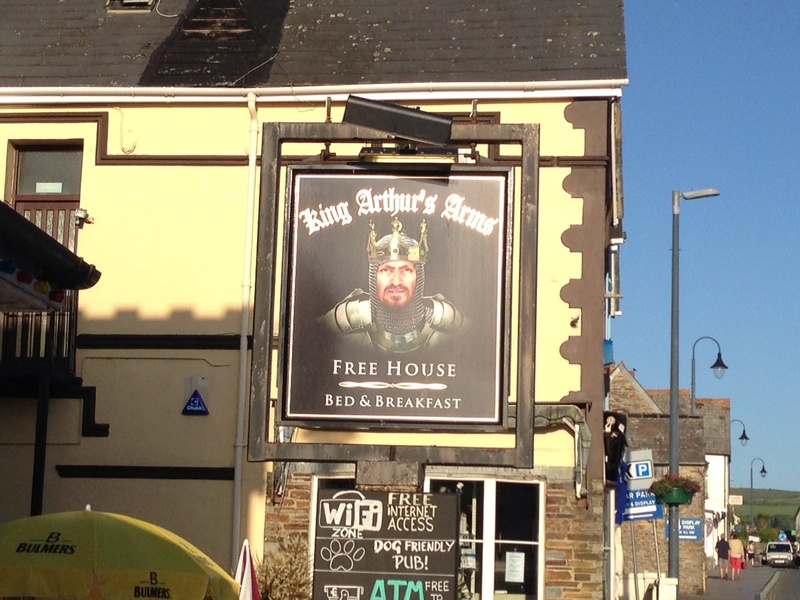 There’s a lot of King Arthur based paraphanalia in the town, including the pub in the above photo, and Merlin’s Cyrstal Cave. One can well imagine how the countryside and coastline around here inspired some of the great tales associated with King Arthur and his knights. 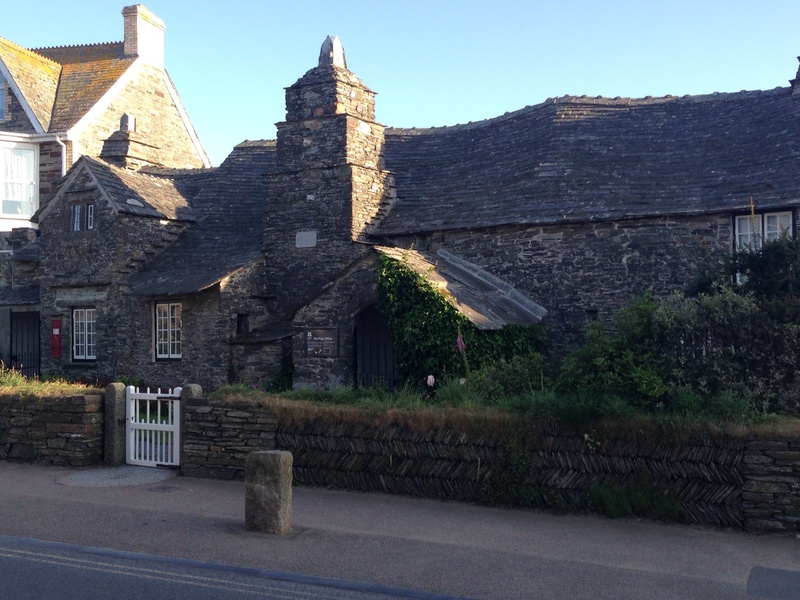 I also stopped at the Old Post Office, a 14 Century stone building owned by the National Trust now. I took the coast road out of Tintagel, having to deal with a massive and unexpected hill near Treknow where the road suddenly dips down into a gorge like cove. My heart dropped slightly when I saw the downwards slope appear around a corner, totally unexpected as it wasn’t marked on my map with the usual chevrons. 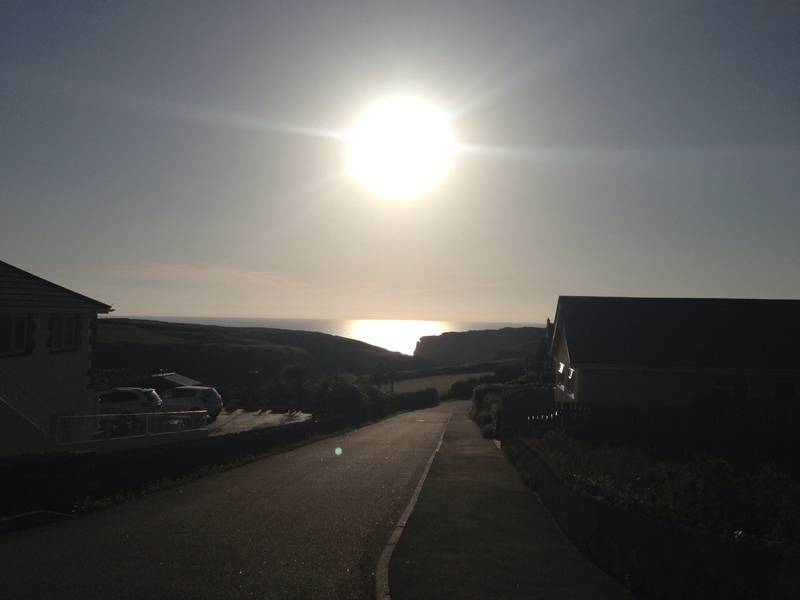 I descended on squealing brakes, and had to push up the other side to Trebarwith Village, it was just too steep; my feet were spinning let alone my wheels. 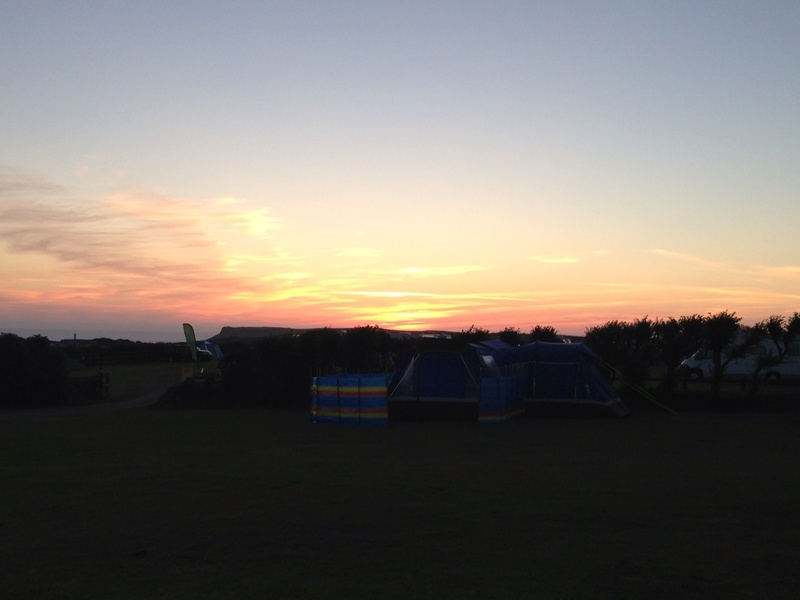 With the sun starting to dip towards the horizon I pedalled on down the B3314 to Polzeath and the Southwinds campsite, a few final hills making my legs ache. It was great cycling through the countryside as the sun started to set, lighting up the sky with some wonderful colours. I arrived at the Southwinds at about 21.00, a late stop but I was feeling good after covering 85 miles, with the bike running well again. I booked in and set up quick, then had a shower to wash away the day’s grime. This was a particularly pleasant experience after getting very hot and sweaty in the gorgeous weather. There’s a bar/restaurant just next to the campsite, Sundowners at Carruan Farm. It’s owned and run by Matt and was a great find after a hard day. I arrived once they’d stopped serving food officially, however Matt was able to knock me up a hearty sandwich, which with a pint of cider was just what I needed anyway. Sundowners is a lovely establishment, only having opened fairly recently. 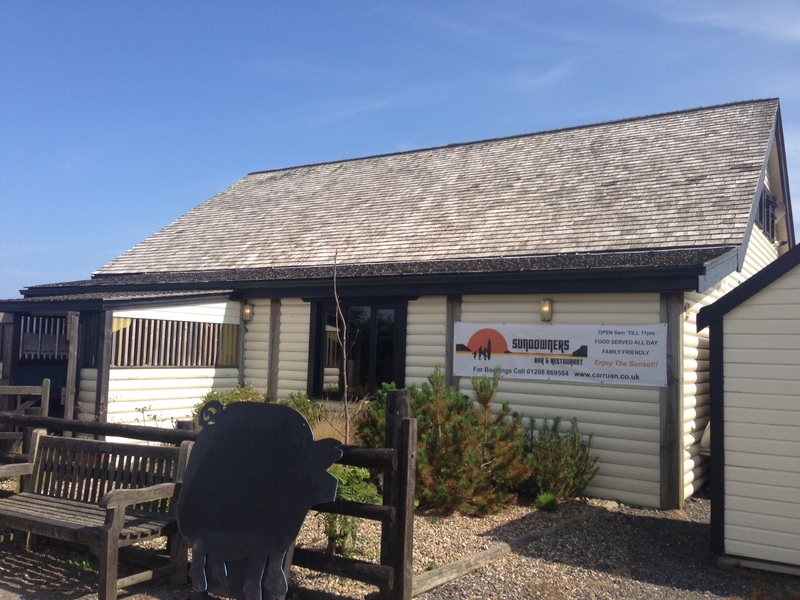 It’s a basically a big wooden barn structure, with a bar and restaurant area, and great views out over the coast. I spent a couple of hours winding down, chatting with Matt about various things. I’ve always had a slight yearning to run a bar or cafe/bar, with a theme to it, and Matt brought me up to speed with some of the challenges, such as what to do in winter time when business can fall off. Bad weather can also have a big impact, especially down in Cornwall, however it looked like the summer was starting to shape up so it should be a good one for Sundowners. 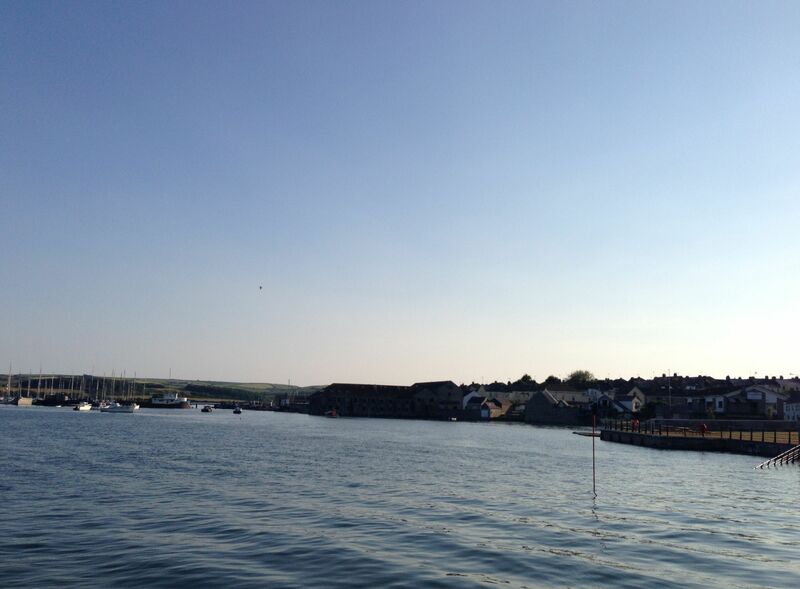 Matt is also a lifeboat man, for the boat based out of Padstow which is just across the River Camel from Polzeath. As expected most of the incidents the lifeboat is called out for are to rescue people that have got in trouble on runaway lilos, or after being trapped by the tide somewhere, rather than boats getting into difficulties. One of the big issues the lifeboat crew faces these days is land based, with a lot of the local houses being bought up as second homes. 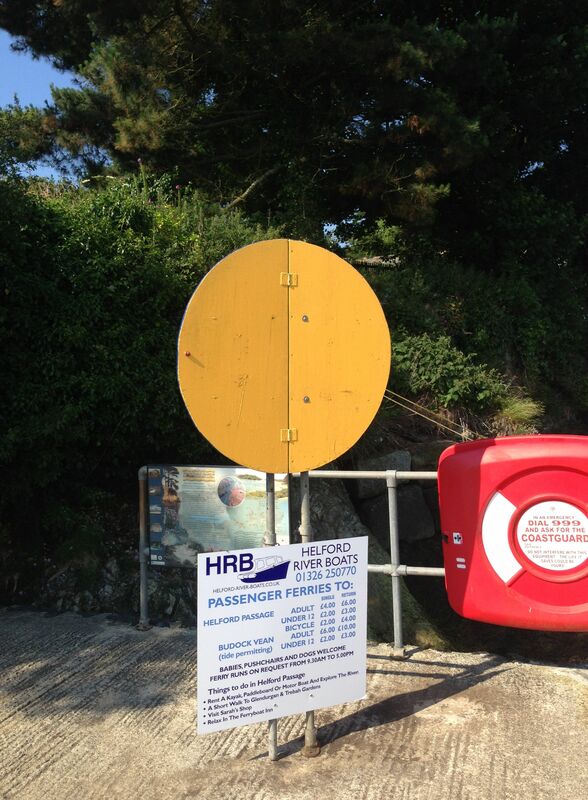 This means the crew can’t necessarily live close enough to the lifeboat station to provide a fast response. I’m not really sure what you can do about that. You can’t stop a local from selling their house to someone from London for well over the odds, but likewise it’s a shame that communities and services can suffer as a result. Chatting through my route for the next few days Matt advised I skip Newquay, which has become a bit of a dive over recent years. I visited about 18 years ago when it was still relatively nice, but I think it’s gone a bit tacky since then. He recommended I drop in to St. Agnes. a village a bit further down the coast where there’s a cafe he owns, so I added that to the agenda for tomorrow. Tomorrow would also hopefully bring me to, or within throwing distance of, Land’s End. 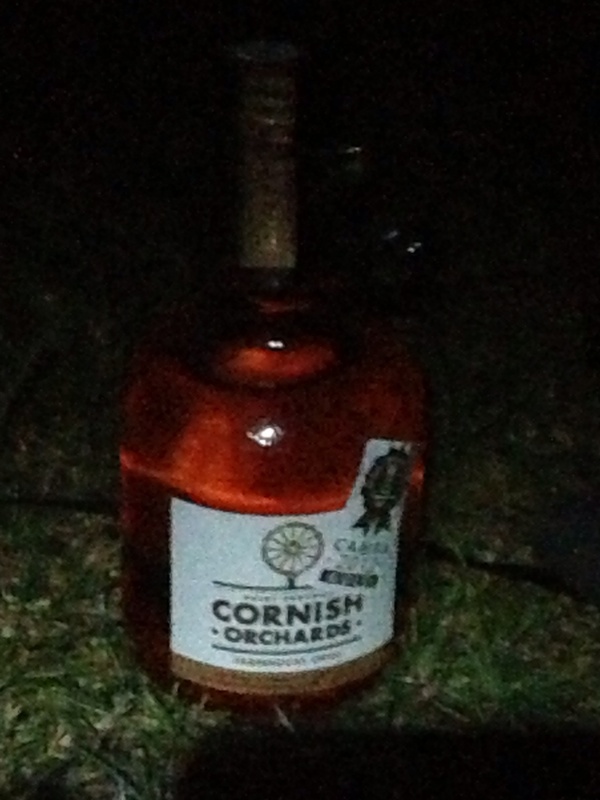 After a very pleasant evening I retreated back to my tent, loaded with a complementary bottle of Scrumpy courtesy of Matt. I’d meant to do some writing, however I couldn’t keep my eyes open and drifted off to sleep, hopeful of another day of good weather tomorrow. This entry was posted in Bike around Britain 2013 and tagged adventure, bicycle, bicycle shop, bike, Bike around Britain, charity, Cornwall, countryside, cycle, cycle touring, cycling, Devon, expedition, fundraising, Hele, outdoors, photos, Polzeath on September 10, 2013 by SelfPropelled.